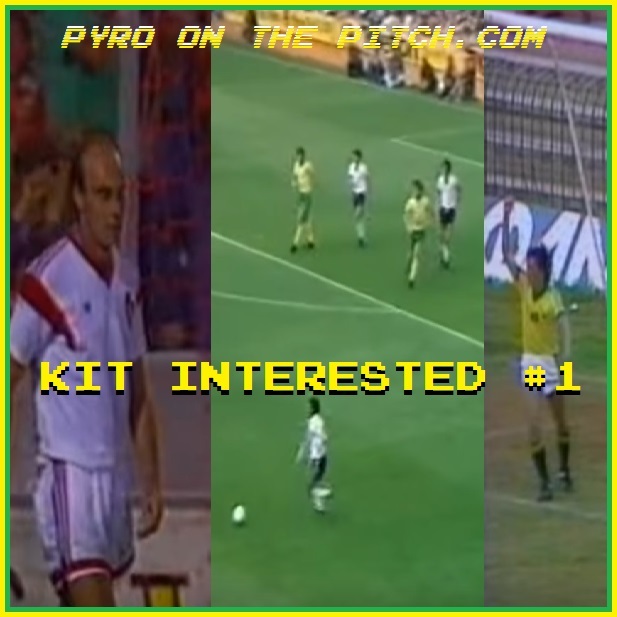 Welcome to our newest feature here on PyroOnThePitch.com, with a series for the kit interested, by the kit interested, and containing interesting kit things (of the vintage variety of course). “Kit Interested” joins Retro Shirt Reviews, the Cold War Classic (over on MuseumOfJerseys.com) and Champagne Kit Campaigns in our regular explorations into the ‘fabric of football’, the appeal of which often results in small decreases in social media followers when certain folk realise that we are equally likely to focus on the grittier side of supporter culture history. We wanted to stress the “interested” part (rather than all-knowing), as we are also keen to learn ourselves, as well as inform. That’s where you lot hopefully come in , as any feedback to fill us in on what we may not know is very welcome. 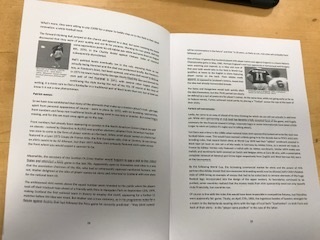 A common complaint of many modern kit-fanatics is that of away and third strips being used in fixtures where they were historically not necessary, mainly – it is assumed – due to marketing reasons (often correctly so). At best, this is considered a callous disregard for the team’s proud traditional colours and at worst can actually create somewhat of a clash where none had existed before (Sheffield Wednesday vs Arsenal in 2015 being a prime example, graciously provided by MuseumOfJerseys since the modern game is not really our era of expertise). Like many aspects of football, however, the tradition of seemingly inexplicable changes stretches back far longer than many might imagine – at least to 1978 when Tottenham Hotspur took on Chelsea in a Division One match. 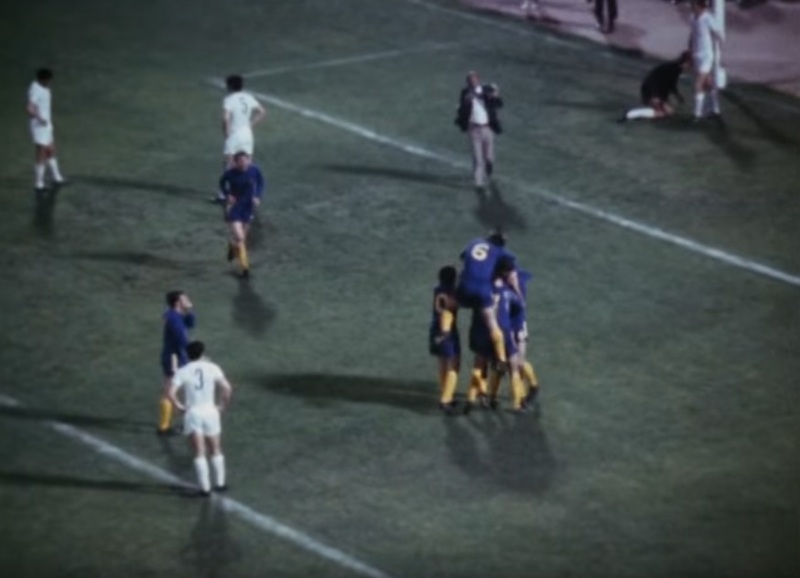 The white shirts of Spurs against the blue of their London rivals never caused an issue of course, but the navy shorts of the former against Chelsea’s continued blue, along with both sides’ white socks, did create a “lower-half clash”. The socks were slightly odd, as the red used now was a reference to the away version, which had green in place of the blue as the primary colour but contained the same red/white ratio on the turnovers. This trim was to compliment the red shirts and white shorts of the away kit, but the colour was only to be found on a sliver of the crest as far as the regular first-choice elements went at the time. 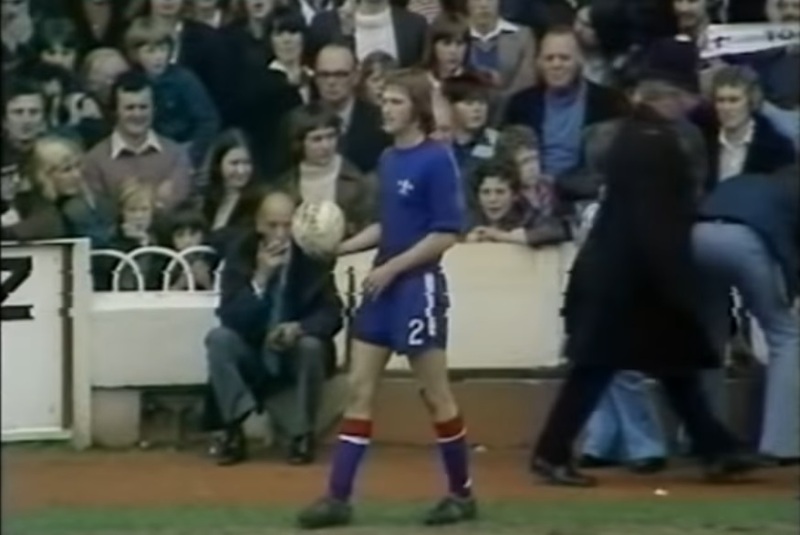 Following a season back in an all-yellow away kit (with blue detailing), Chelsea combined their recent change-colourways by bringing in a yellow/green/yellow strip for 1978/79, with Umbro sleeve-taping retained from it’s debut the year before. 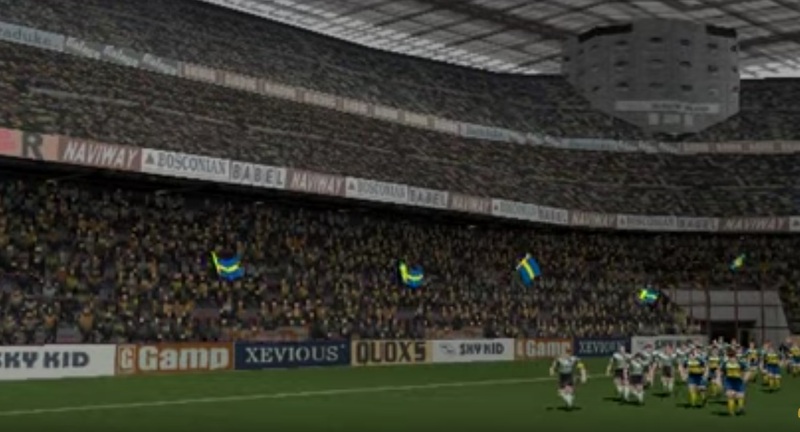 Now back in Division One, the campaign started with the previous season’s home attire employed against Everton at the Bridge, and away to Wolves. While the change may have seemed utterly illogical to some, it seems that using the full away kit was considered the easiest option to avoid any sort of clash entirely. Except to a significant portion of the audience watching highlights at home on TV, a new clash was very much in effect that was far worse than anything seen in the fixture before. 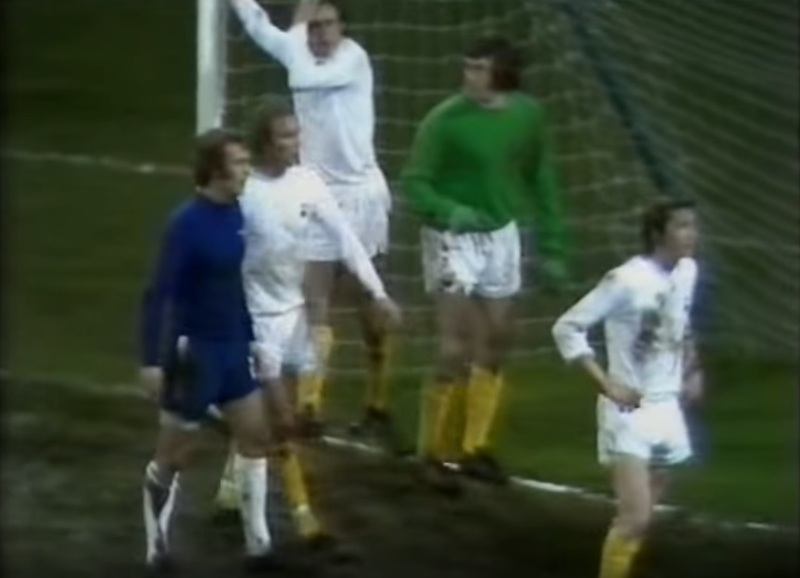 And it’s Chelsea in a change strip of yellow shirts and green shorts, and yellow socks, who are attacking the goal to our right… We apologise if there’s something of a clash if you’re watching in black and white, Spurs in the slightly darker shorts and the slightly whiter shirts. 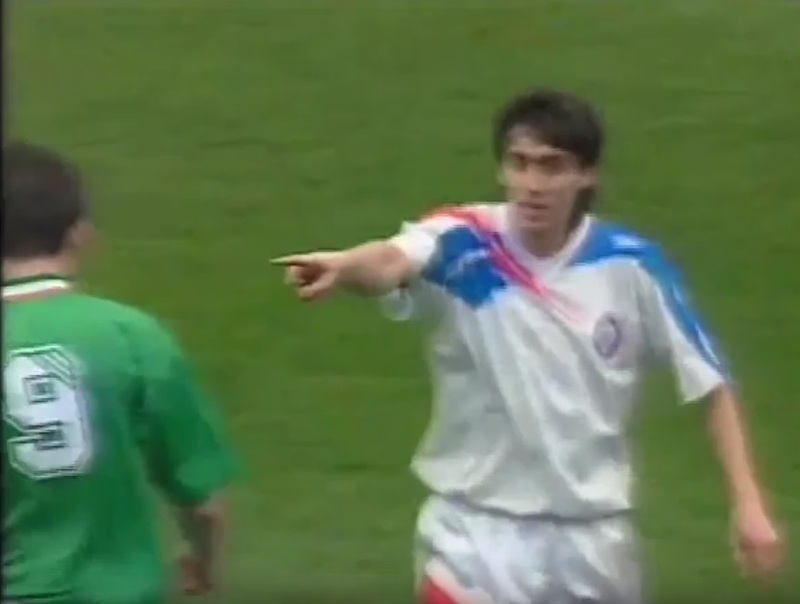 While it may have been unfair on some, the only eyes that really mattered were the ones witnessing and participating in the game live in colour, and to the players, officials and fans, there was a clear, if unusual, distinction. 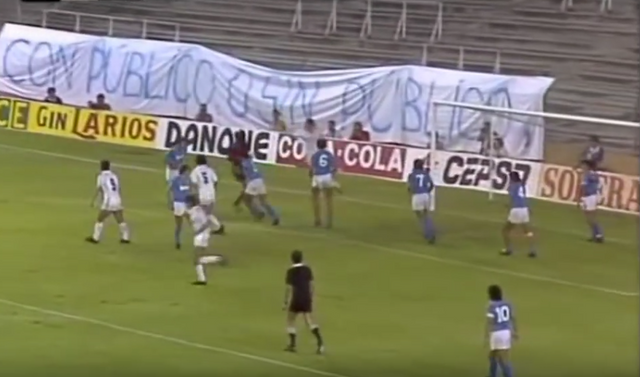 It would have been interesting to see if any of those in attendance that day were savvy enough to cop the potential problem the kit configuration would have without colour, and in fact many doubtlessly did realise when watching the game later on The Big Match. Over the coming years, the black and white clash became less and less of an issue as technology advanced and prices of colour televisions lowered (although, surprisingly, 12,000 black and white TVs remained licensed in the UK as of 2014). 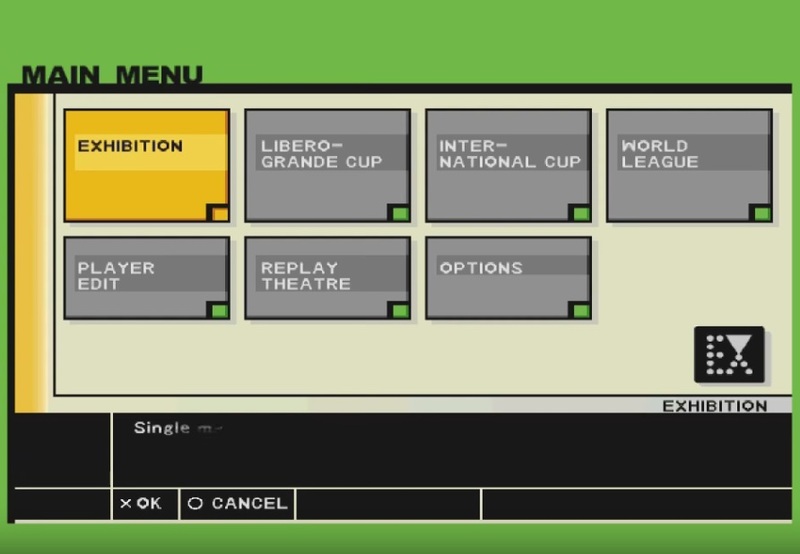 But on a global scale, with the world’s varying degrees of ‘development’, the clash remained an important factor for FIFA and contributed to the the strict distinctions demanded (resulting in some memorable mash-ups) in World Cup matches for years to come. One kit trope that we love here at POTP, is when a team who aren’t usually known for it wear white shorts with their otherwise usual home colours. 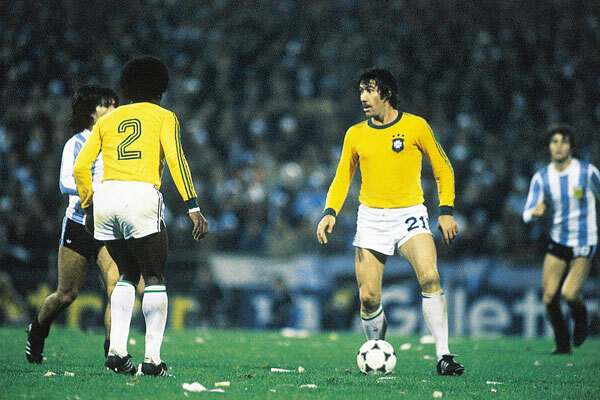 Two classic examples stem from the 1978 World Cup, when both Brazil and Spain (see last link above) were forced to swap their blue shorts for white due to clashes against Argentina and Sweden respectively. 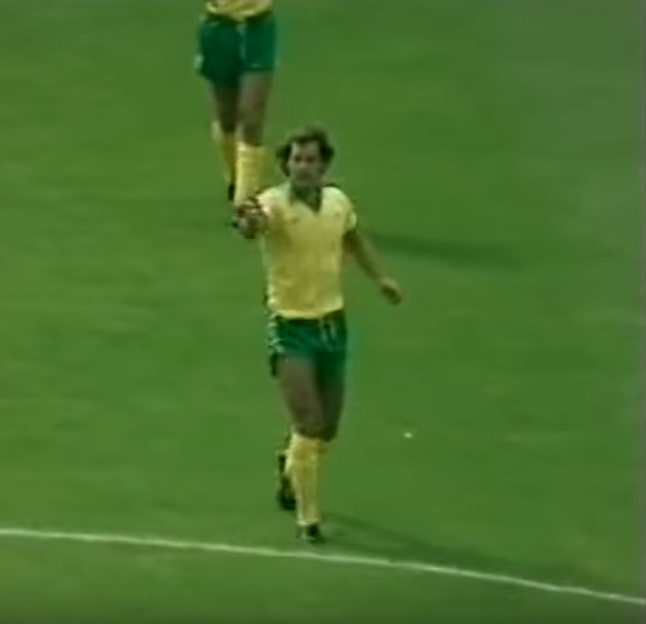 Several years later, Australia (now “fully-Umbro’d”) traveled to play Greece in November 1980, as part of a European tour that also included a game against England at St. Andrews, before a ‘club vs country’ affair with Leicester City. 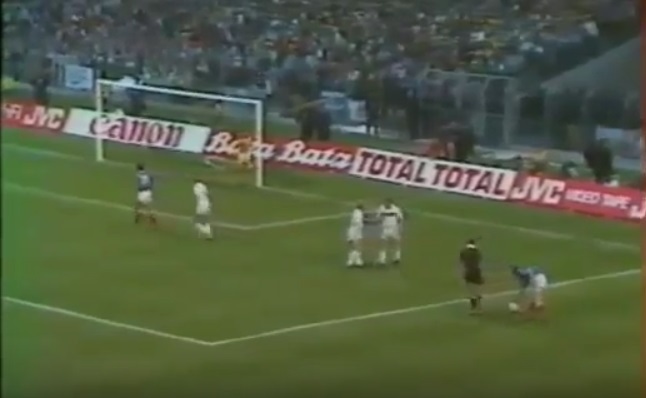 While the English match would be the main event, the Greeks themselves had just come off their first ever major tournament appearance at Euro 80, which they had followed with 0-1 World Cup qualifier defeat to Denmark. While not as crazy as the 1974 jersey, the Australian shirt by this time was still pleasingly odd in a perfectly Ozzie way. In the late 70s, Umbro had introduced a wordmark under their diamond logo, including on Australian kits. But uniquely (?) for the 80-82 iteration, the “umbro” now appeared on one side of the centralised crest, and the double diamond on the other. This is because the company had originally started life in 1949 as the Japanese footware-firm ‘Onitsuka Tiger’ and had only rebranded to ASICS (an acronym for the Latin “anima sana in corpore sano” – “healthy soul in a healthy body”) in 1977, with the logo having first appeared on running shoes back in 1966. 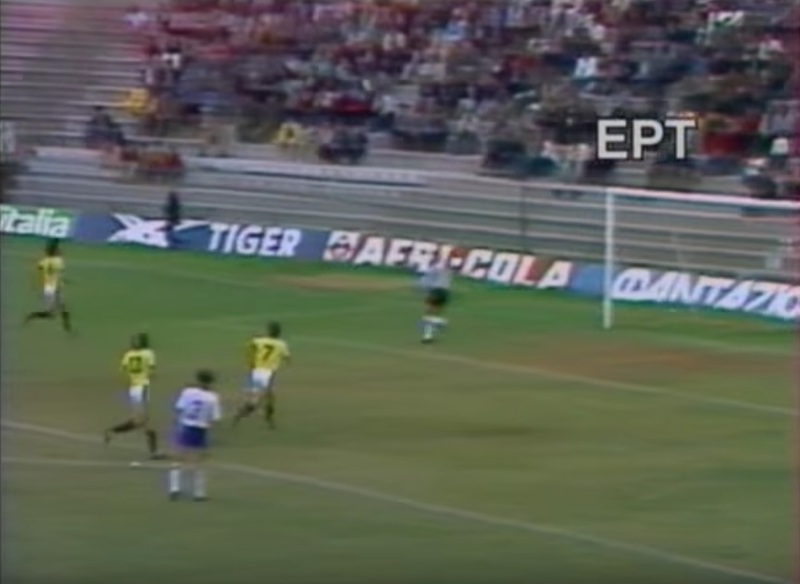 The ‘Tiger’ theme is still used by ASICS to this day when it comes to trainers, but evidentially it might also have applied to their tentative first steps into the football kit world in the early 80s. 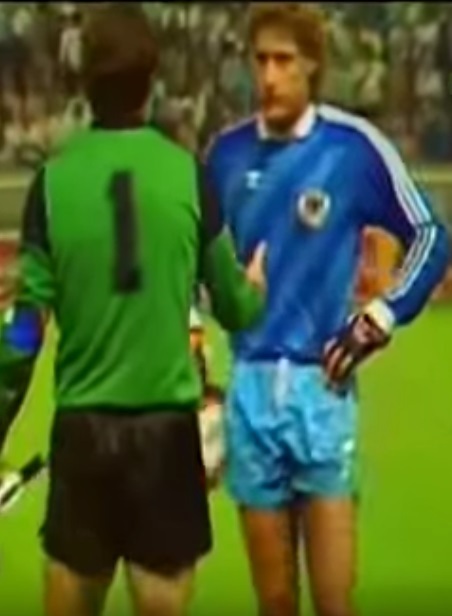 Breaking down the kit choices side by side, it seems plausible that the reason for the Greeks not to wear their home blue shirts may have been because the Australian ‘keeper was also wearing blue (see below), and so the away shorts and socks were also used. 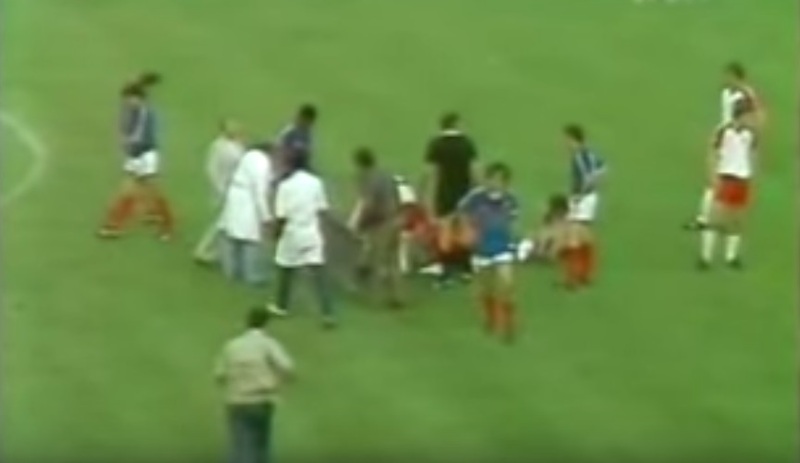 Then, even though sock clashes wouldn’t have been considered a pressing issue in friendlies, the Australians changed to their alternative white shorts and green socks, perhaps to account for the aforementioned “black and white clash” which would have occurred on certain TVs (presumably a greater issue in poorer Greece than it was in the UK in 1978). After a 3-3 draw, the boys from Down Under moved on to Britain for their match against an English side who, like Greece, would be in white/blue/white. Unlike with the Greeks though, this was England’s expectant first strip so perhaps yellow/white/green had been the Australians plan for the tour all along. Unfortunately, there doesn’t seem to be any visual evidence for the England game or what was worn. But this brilliant website does display an Australia away jersey that was apparently used against Leicester a few day later, suggesting that two full kits were more than likely brought with each element used as needed. Or was there just two jerseys? We have one more example of white shorts being surprisingly inserted into an established national kit, but this time it would not be a forced mash-up – rather, a conscious change of style direction. 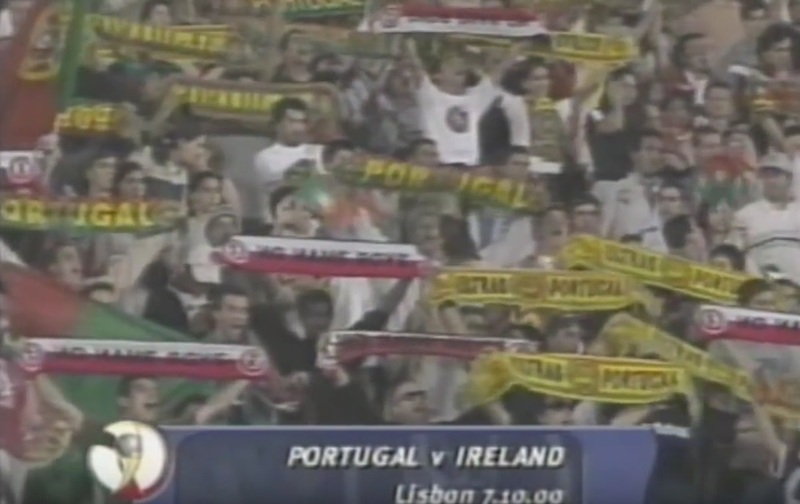 The country in question is Portugal, who may have took inspiration from their Iberian cousins change at World Cup 78 and decided they wanted the look for themselves…twelve years later. 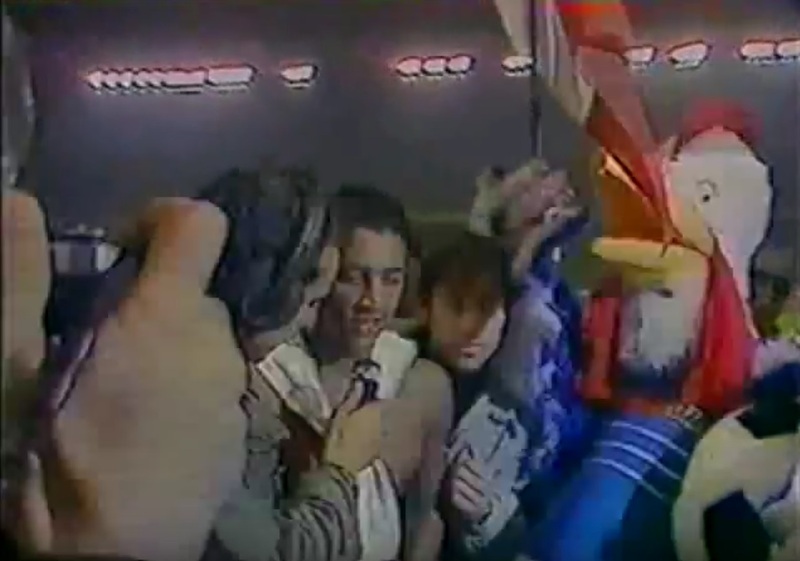 Ditching the white shorts theme, but very much continuing with the Portuguese theme, Portugal are well known around these parts for their continued use of an Adidas trefoil shirt as late as December 1994 (seen below vs Lichtenstein, December 94; the same template that had debuted in it’s away version against Luxembourg in 91). 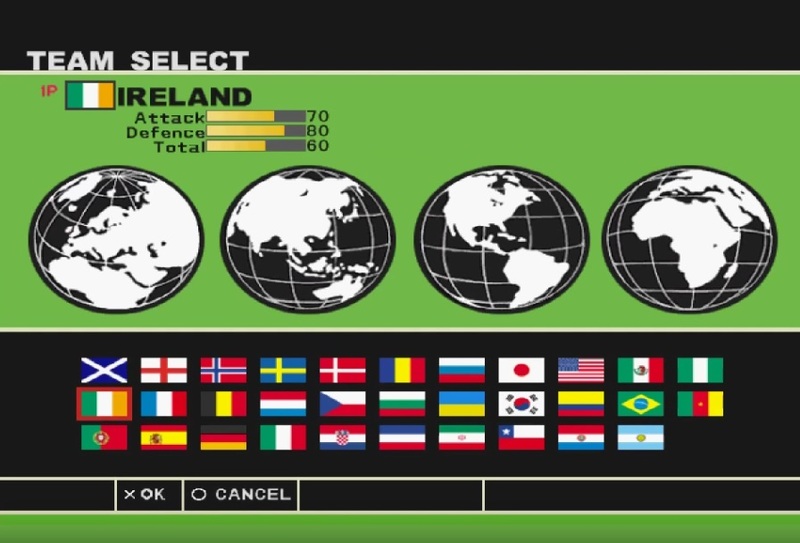 This seems shockingly out of date when some nations, such as Ireland, were on their third generation of shirt past the trefoil (Equipment; World Cup 94; Umbro), and were most likely the last ‘major nation’ to do so (at least in Europe). 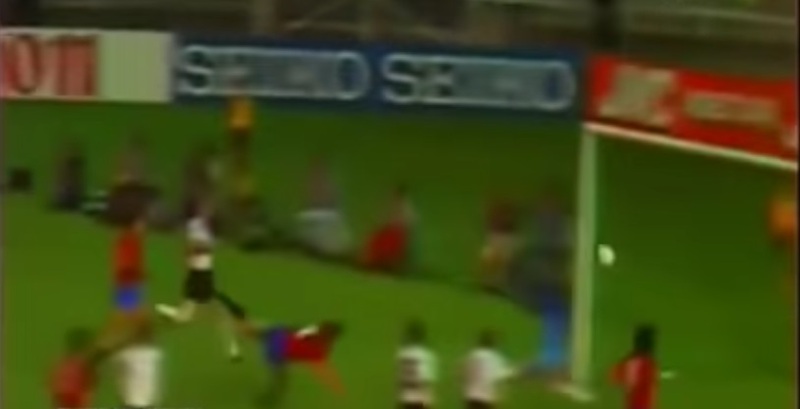 The away and third kits that year, however, were full on Adidas Equipment – the “post-World Cup qualifers style” that added corresponding lower sections the diagonal shoulder bars. 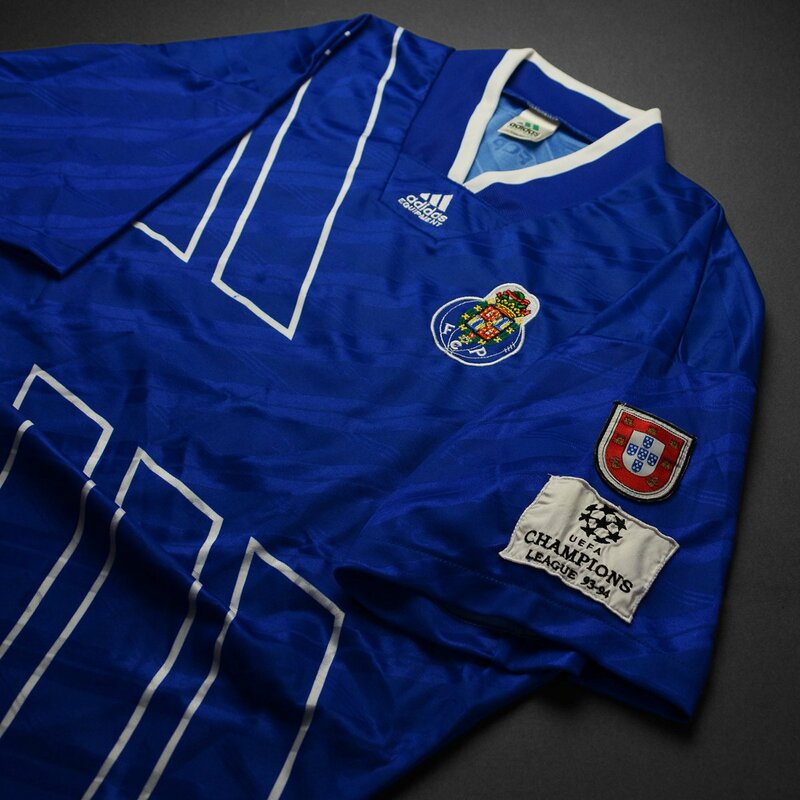 While most sides used this template with a primary background colour and secondary bar colour, Porto ingeniously only coloured the outlines of the bars, effectively creating all-white and all-blue strips that wouldn’t cause an issue against the blue or white clad team that had triggered the switch in the first place. Funnily enough, the only consistent feature throughout was those old 1990-shorts from the home kit, which had been retained in the first-choice strip when the trefoil shirt was dropped. 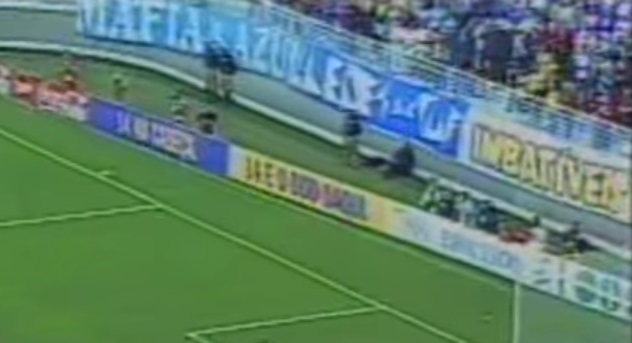 This meant that during Porto’s 93/94 season, the shorts had somehow ended-up paired with at least four different jerseys that they had never intended to be used with. Finally, for this bumper first of edition of Kit Interested, we turn to the Republic of Ireland, who’s 1992-1994 Adidas strips were recently highlighted in Campaign Kit Campaigns #4 and #5. In the latter of these, it was mentioned that after two World Cups the Irish had yet to lose a WC finals match in their home shirt, and equally yet to win a WC finals match in their away shirt. 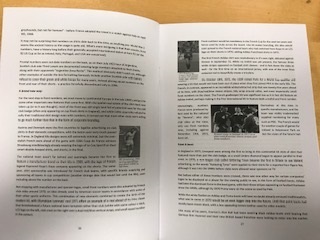 Our previous Football Special Report was the first to deviate from the original format of highlighting a specific interesting match and what it entailed (but that is currently a fanzine exclusive installment). 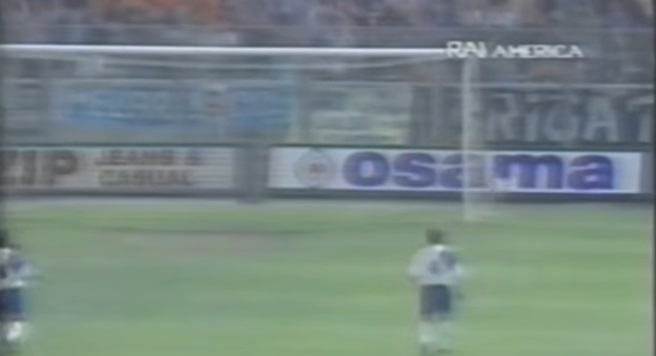 Now, having continued to peer quizzically around the retro footballing world, we cast our gaze upon the Euros of 1984. 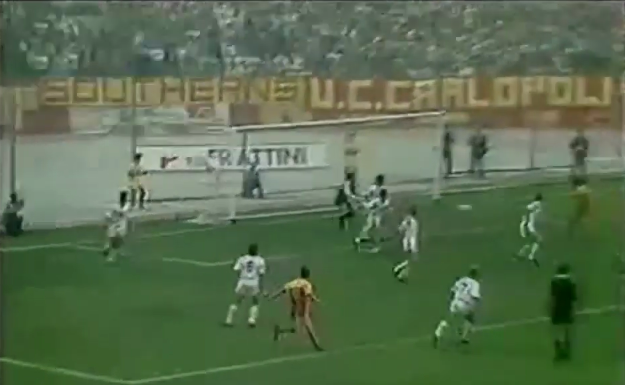 The 1980 European Championships in Italy had been the first to feature eight teams in the competition, rather than the four that had been involved since the inaugural 1960 edition. But, uniquely for an eight team format, 80 would only see the top placed team in each group progress, with the two runners-up granted the “honour” of a third place play-off. West Germany defeated Belgium in the final in Rome to take their second championship in the last three Euros, after the Soviet Union, Spain, Italy and Czechoslovakia had also picked up continental wins in the 60s and 70s. 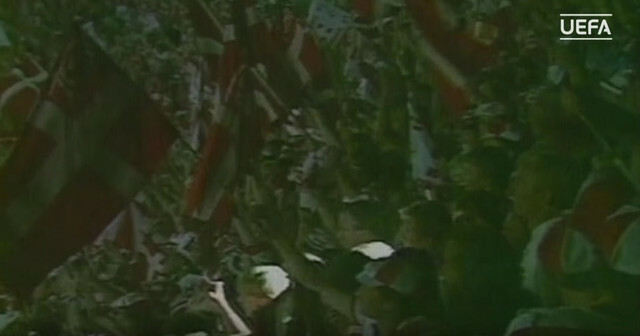 The latest West German triumph, following their second World Cup victory in 1974 (with further runner-up spots at both a Euros and World Cup to their name), had consolidated their status as Europe’s top team, and the nation’s footballing administrators hoped to be rewarded by bringing the tournament to their country in 1984. The West German squad celebrate on the pitch after winning the Euro 80 final against Belgium, 22/06/1980. The only other nation to contest the bidding process was France, who had hosted the original competition in 1960. The 74 West German World Cup was perhaps too fresh in the memory of the UEFA Executive Committee, who unanimously voted for the French to hold the next European Championships in a December 1981 meeting (although Germany would not have too long to wait for their turn). 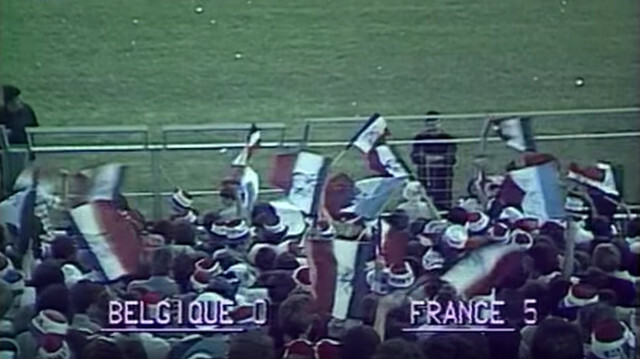 With the ball for Euro 84 now rolling, the next step was the qualifying draw in Paris in January 1982. 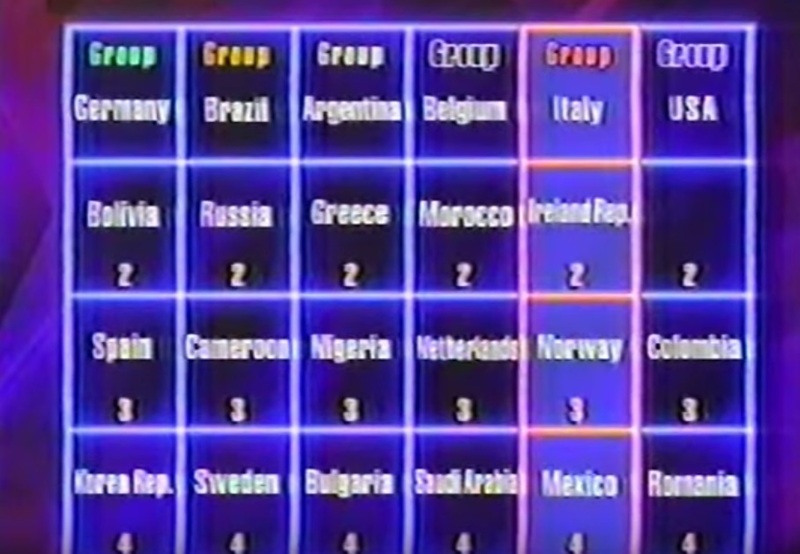 France of course entered automatically as hosts, leaving 32 other European nations to make up seven groups of four and five where the top placed finishers would progress. 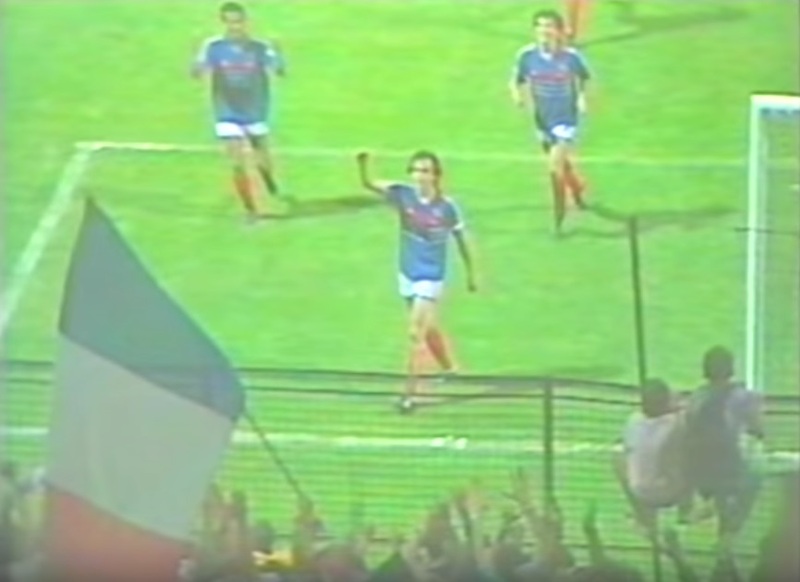 Played out between May 1982 and December 1983, the only group that proved particularly clearly cut for the eventual victors was Belgium’s Group 1. 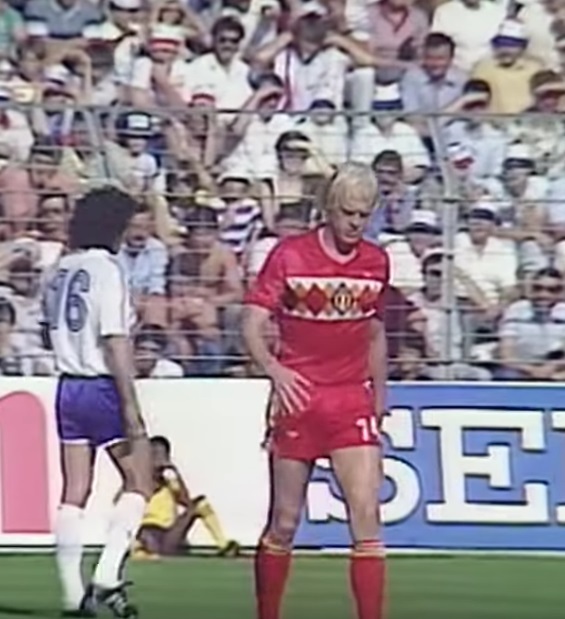 Entering a third European Championships, the Belgians had comfortably seen off Switzerland, East Germany and a poor last placed Scotland, with their only group loss coming to the Swiss after qualification had already be secured. 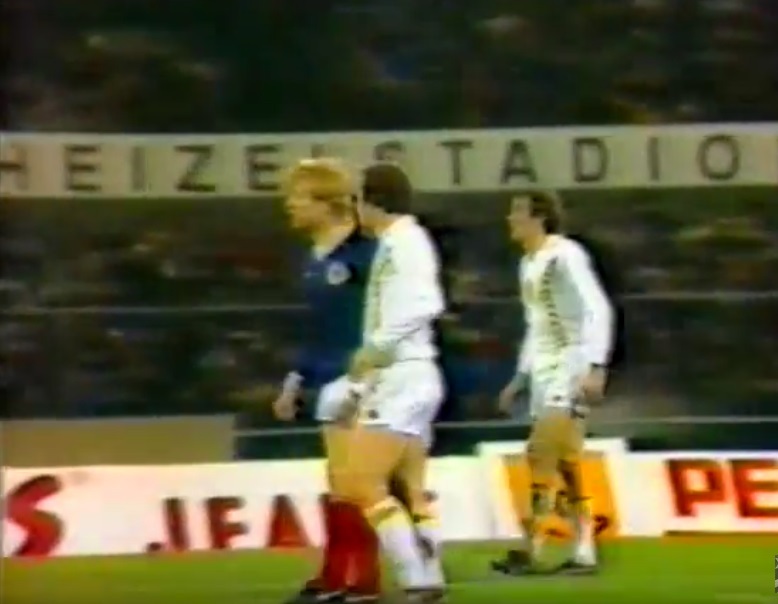 Belgium vs Scotland in the yet-to-be-infamous Heysel Stadium, 15/12/1982. 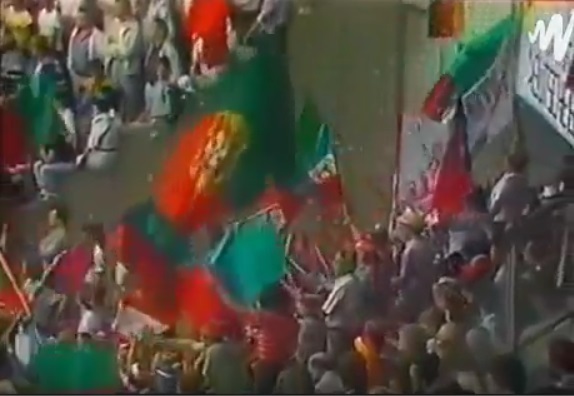 Group 2, conversely, came down to a last day decider between Portugal and the USSR in Lisbon. 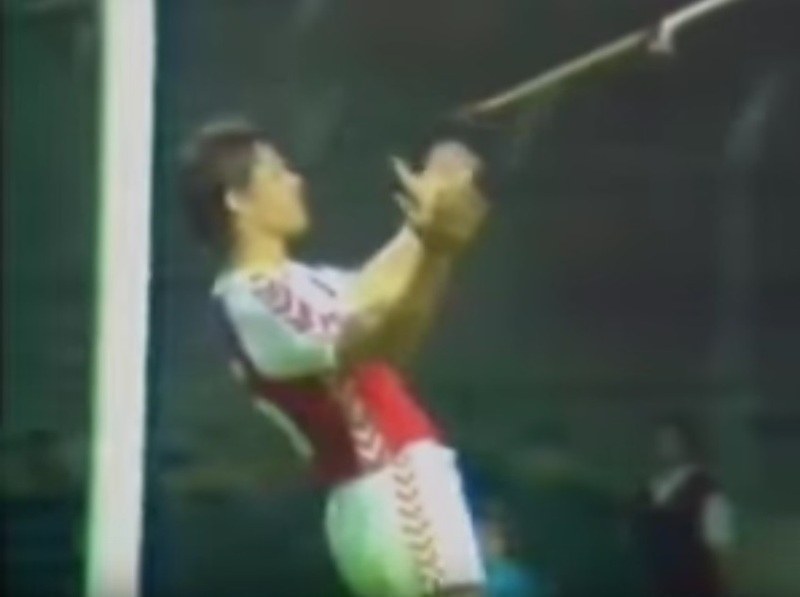 With Poland and Finland already out of the running, the Portuguese claimed a 1-0 win to leapfrog the Soviets into first, and in doing so made their first major finals since World Cup 66. Group 3 started with a smoky affair in Copenhagen between Denmark and England where the points were shared. 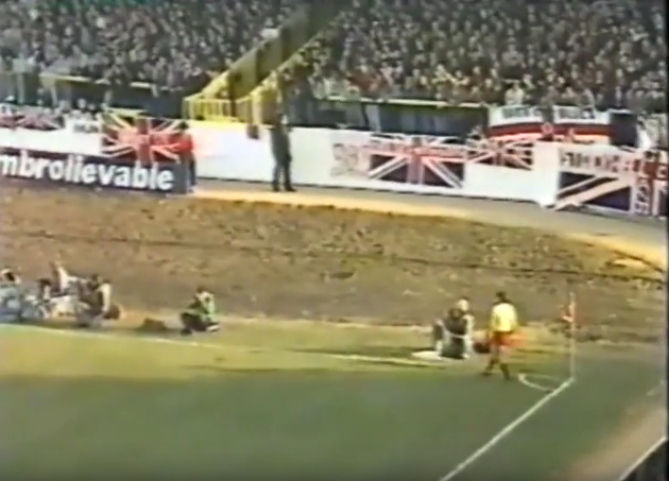 A further blip occurred for the the English when they drew 0-0 at home to Greece in March 83, before the Danes astonishingly took “all two points” (still awarded for a win instead of three at this time) in Wembley in September. 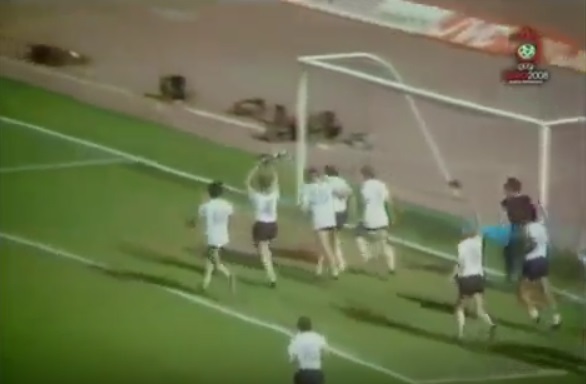 9-0 and 0-4 defeats of Luxembourg, as well as home and away victories over Hungary, were not enough for the unconvincing English, as a 0-2 win over Greece in November 83 sealed an exciting Denmark team’s qualification by a single point. 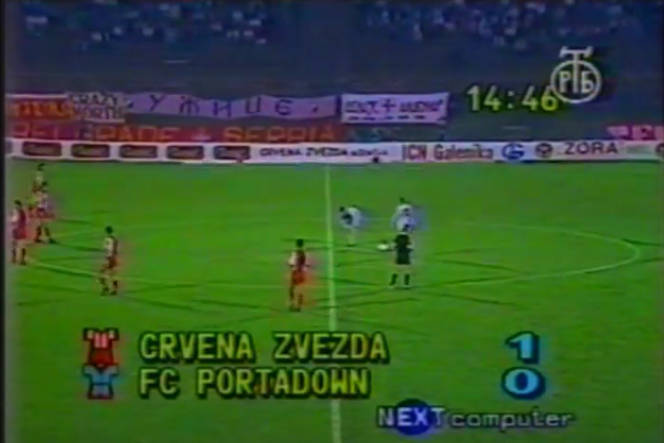 In Group 4, three-time tournament participants Yugoslavia proved too strong for the Welsh, Bulgarians and Norwegians, taking pole position with eight points to Wales’ seven. Similarly in Group 5, Romania impressively came out trumps over Sweden by a point, as supposed heavyweights Italy and Czechoslovakia disappointingly finishing third and fourth with Cyprus propping up the table. 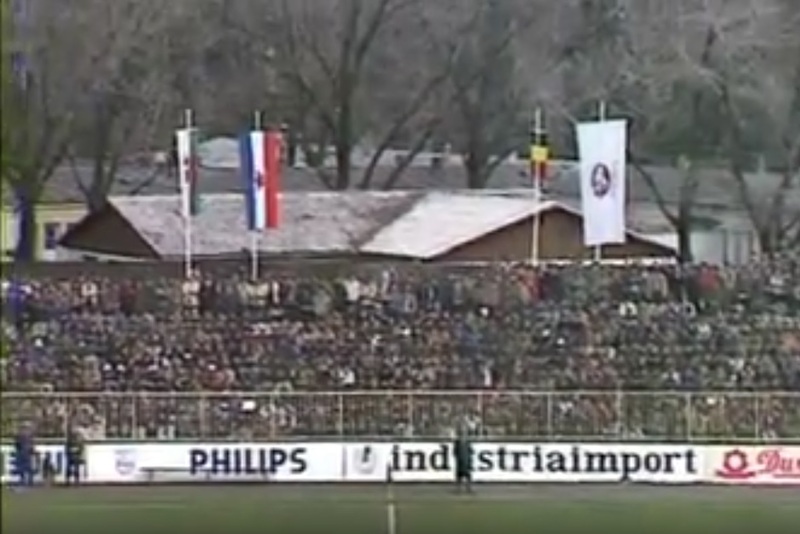 The picturesque scene for Yugoslavia and Wales' Euro qualifier in Titograd (now Podgorica, capital of Montenegro) that would end in a 4-4 draw, 15/12/1982. 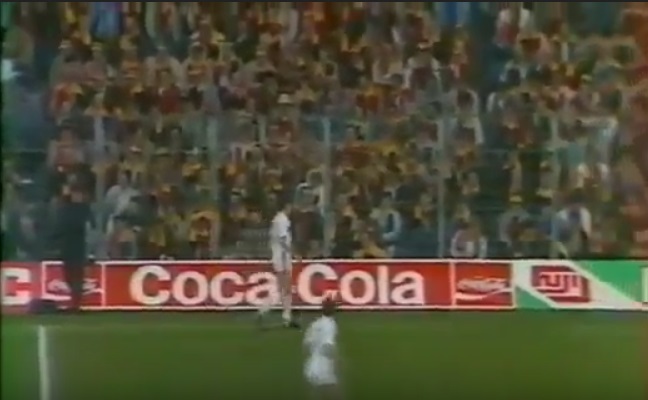 While Austria, Turkey and Albania made up the numbers, Northern Ireland looked set to qualify ahead of West Germany in Group 6 after a marvelous 0-1 upset in Hamburg in November, 1983, having already won on home soil in Belfast. 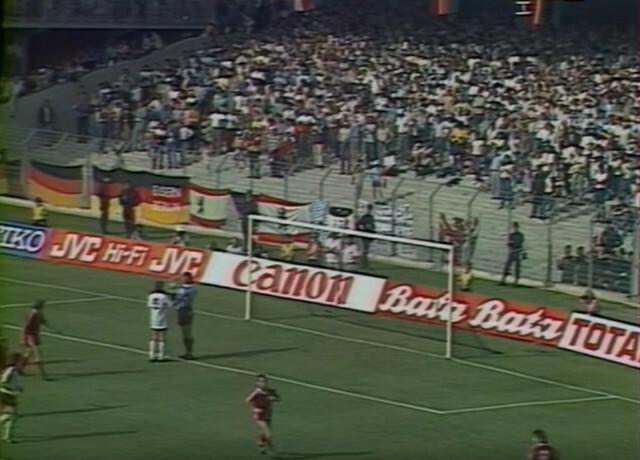 The Germans still had to play Albania in Saarbrücken five days later, but the waiting North were on course to make it to their first ever Euros until the 79th minute when the home team finally went 2-1 up; both West Germany and Northern Ireland finished level on 11 points, but the former went through on goal difference. 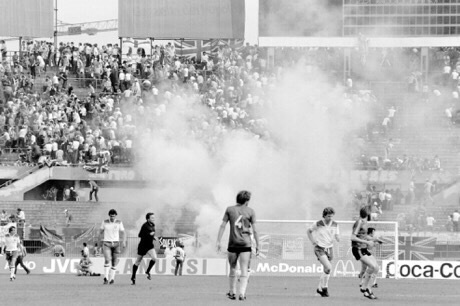 Northern Ireland fans in Hamburg for their side's 0-1 Euro qualifier win away to West Germany, 16/11/1983. 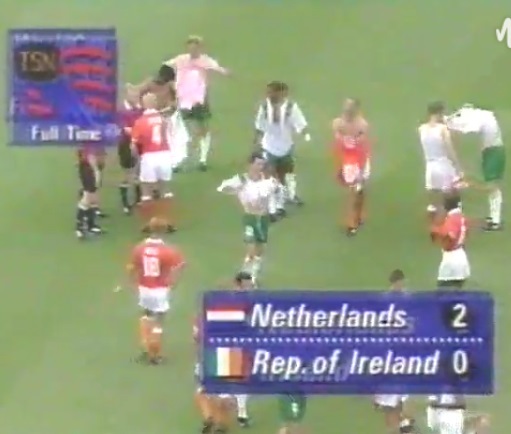 The last group, Group 7, turned out to be a similar situation, as Netherlands and Spain emerged ahead of Ireland, Iceland, and group whipping boys Malta (although they did beat Iceland 2-1 in the first game of the group). But what was to come in the final round of fixtures proved the most intriguing situation in all the qualifiers. 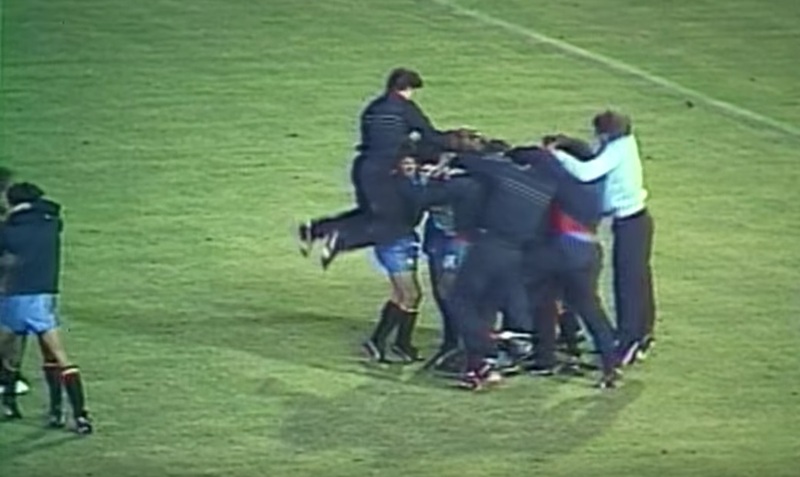 Having lost only once (away to each other) in their games up to now, the Dutch and the Spanish went to into December 1983 level on eleven points, both with one last respective home game against Malta to come. It would effectively be a straight shoot out against the poor Maltese, to see who could amass the greater goal difference and advance. First came the attempt of the Netherlands who ended up 5-0 winners in Rotterdam, delivering a final goal difference of +16. 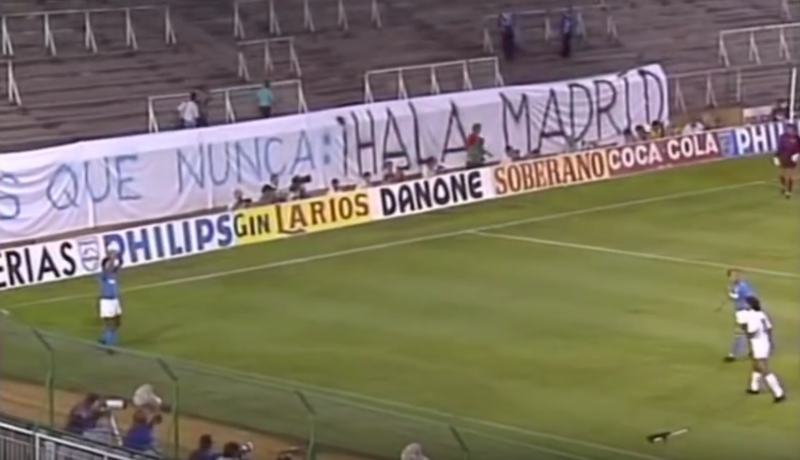 As Spain currently had +5, this meant an eleven goal victory was needed in Madrid five days later for the home side to qualify, but the Maltese goalkeeper brazenly and bizarrely claimed beforehand that the Spanish could not even score eleven goals past a team of children. Spain missed a penalty minutes into the match, before going into the break only 3-1 up. 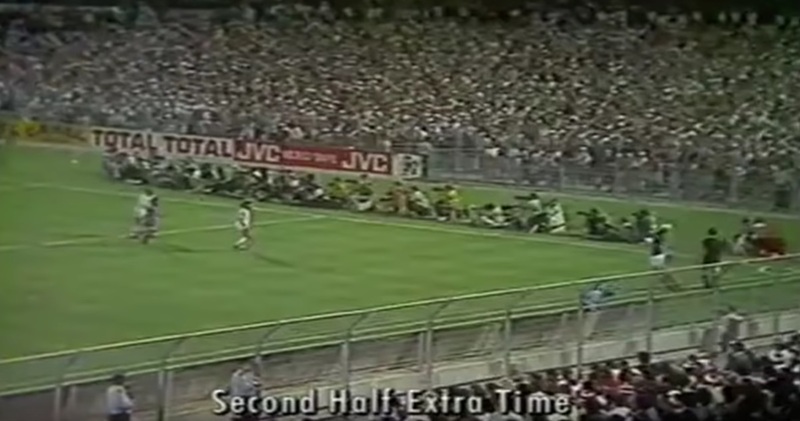 To the delight of the crowd though, an amazing nine goals were scored after half time, with the last in the 84th minute making it 12-1 come the final whistle. 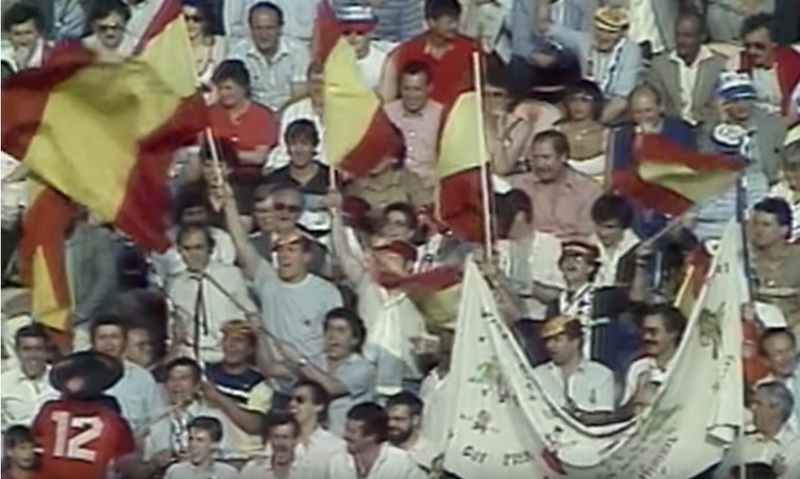 The Spanish were through, but of course questions of bribery were instantly raised, along with sinister claims by two Maltese players of doping as “they (the Spanish players) had foam in their mouths and could not stop drinking water”. 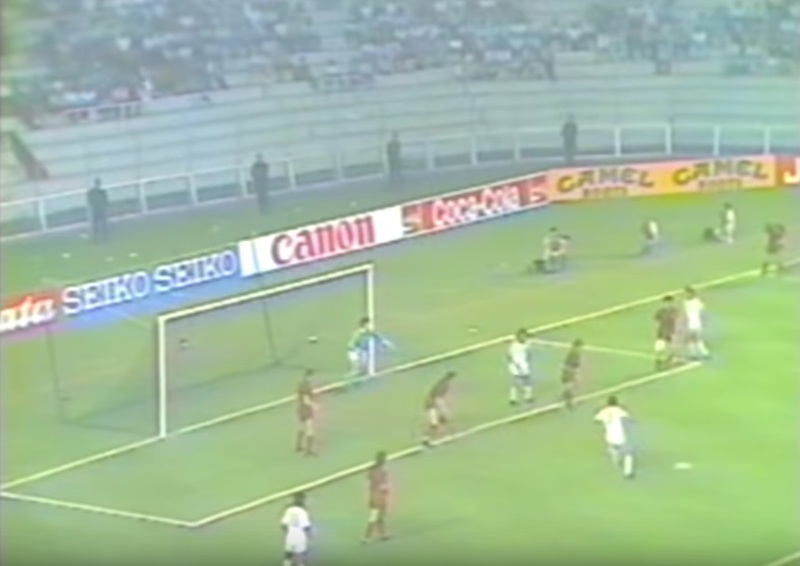 The 12th goal in the 12-1 win over Malta that sent Spain to Euro 84, 21/12/1983. 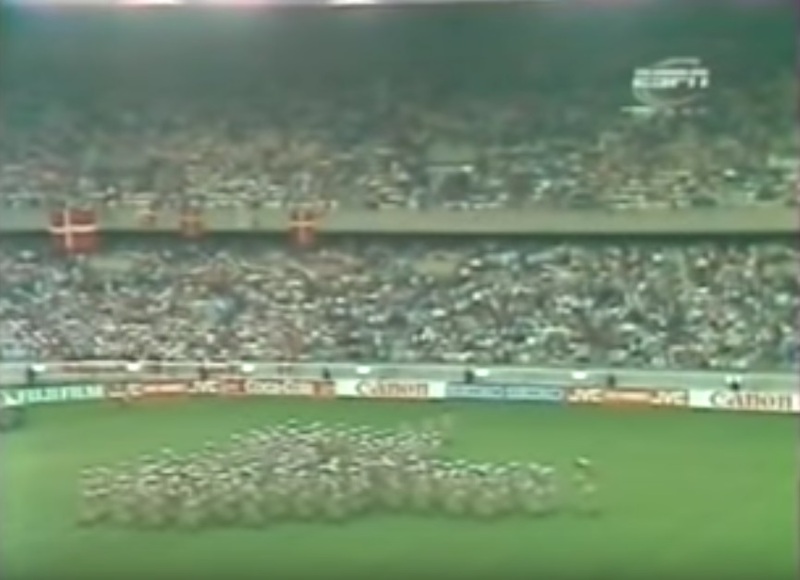 Like the 78 World Cup final, the Dutch could perhaps feel hard done by and, after already missing out on Euro 80 and World Cup 82, they would have to wait another four years before they would finally return to the big time when they would at last win a trophy. 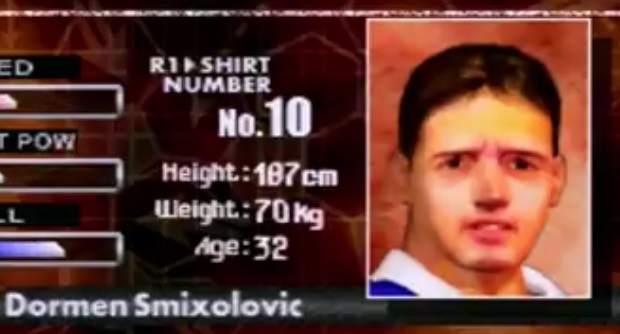 Regardless, the eight finalists going to France had been decided, pleasingly with two debutante qualifiers (Portugal and Romania); two making their second appearance (Denmark and France); two making their third appearance (Belgium and Spain); and, you guessed it, two making their fourth appearance (Yugoslavia and West Germany). The format for the upcoming tournament was again adapted, as the top two countries in each group would now thankfully progress to semi-finals before the final; equally thankfully, the rather useless third place play-off was dropped. The eight cities of Paris, Marseille, Lyon, Saint-Étienne, Lens, Nantes, Strasbourg were to host the matches, and a trim squad of twenty was to be brought by each qualifying nation. One thing that jumps out about this tournament was some amazing synchronicity in scorelines between games played on the same day. Only one goal in each group would end up preventing identical scorelines in Group 1, and identical results in Group 2. Another major feature was some of the revolutionary jerseys on show, with both France and Belgium in spectacular bespoke Adidas designs that were primed for retro-revivals in years to come. 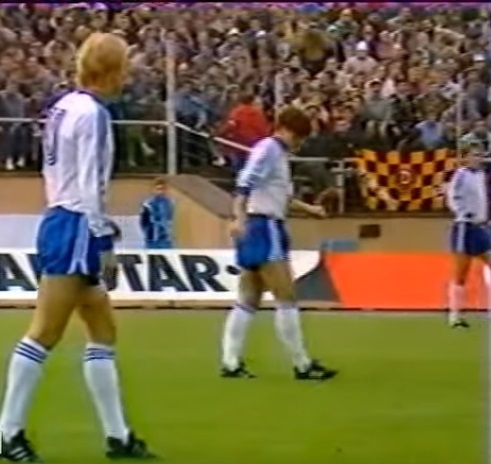 The Germans and Romanians used Adidas’s slightly more understated “Aberdeen” template, with Portugal and Yugoslavia rocking the mega-classy, diagonal pin-striped “Chelsea” variety. The only non-Adidas apparel was provided by recent converts Spain, now in Le Coq Sportif, along side the always welcome Hummel of Denmark. France home, Belgium away, Portugal home. 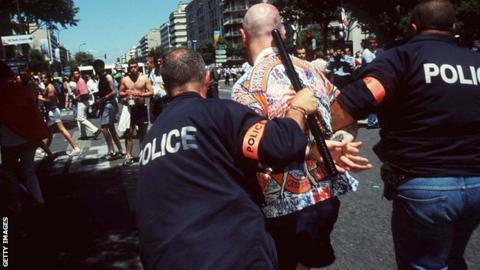 Group 2 was to commence on June 14th, first with the meeting of West Germany and Portugal in Strasbourg – a game notable as the scene for the only major hooligan disturbance during the final. Apparently a group of Germans were responsible for the incidents (we are unclear on what happened exactly), but were swiftly arrested and sent the short distance back across the border. 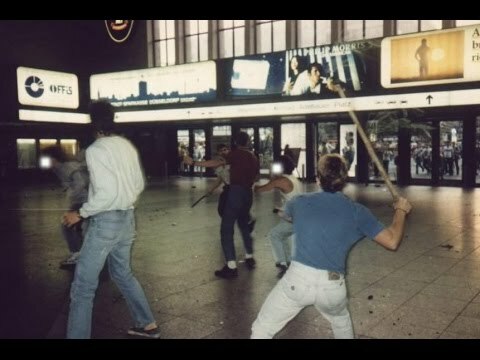 Of course when it came to hooligans, the main difference between Euro 80 and the other European Championships of the time (Euro 80, 88 and 92) was a lack of England, who’s presence would have almost certainly increased the rate of trouble by several hundred percent. 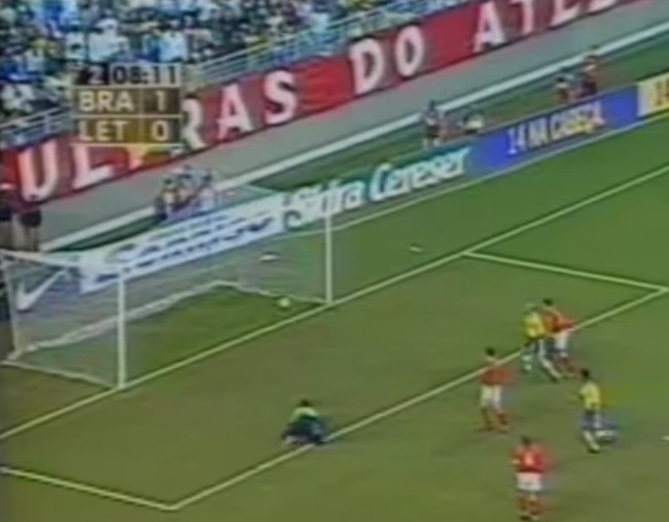 The failure to qualify also meant that the ever-insular English decided against broadcasting most of the tournament live on TV, with only the Spanish-German match and final set to be shown in the UK as they happened. 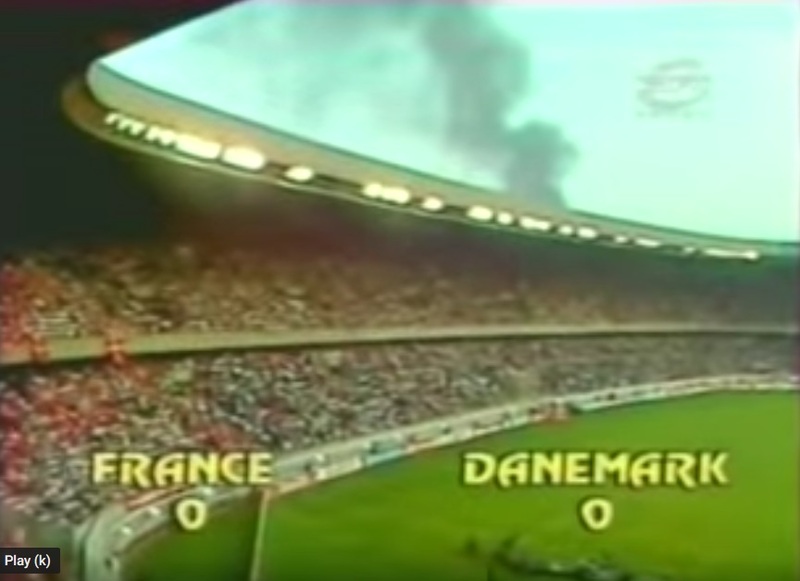 Stade de Gerland in Lyon was the scene a couple of hours later for Denmark vs Yugoslavia and amazingly it would be another 5-0 scoreline, this time with the Danes taking the points. 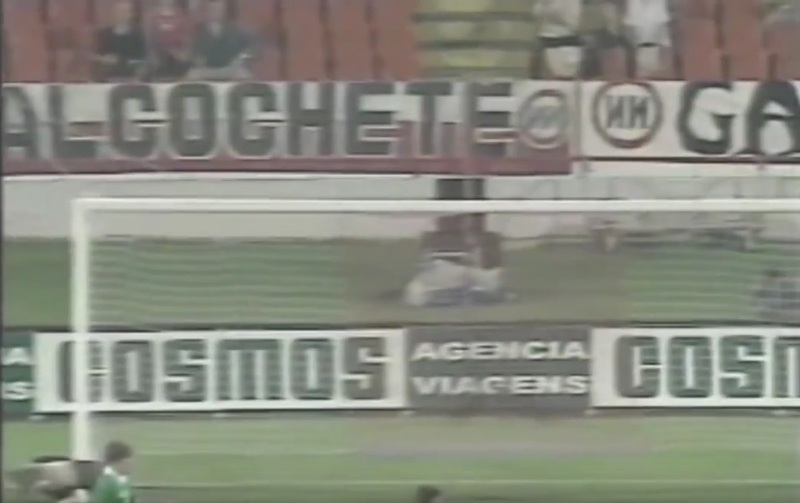 The heavy loss was not what you would expect of the “Brazil of Europe” (as the Balkan superstate were known with regards only to football) and, reflecting this, their manager Todor Veselinović was admitted to hospital after the game for stress and exhaustion. 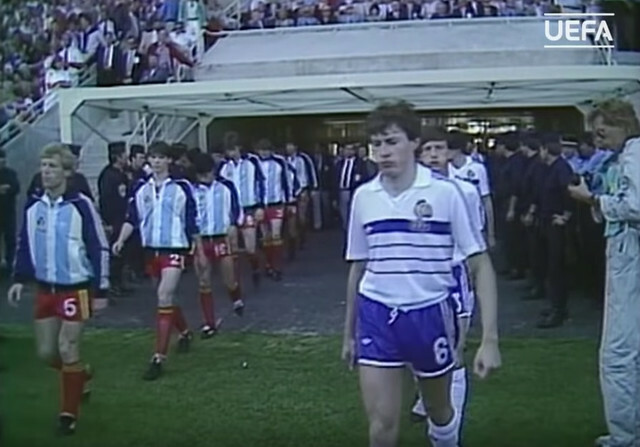 That evening, Marseille’s Stade Vélodrome – the largest stadium in the Championships with 55,000 capacity – saw it’s first use for the Iberian derby between Spain and Portugal. Unfortunately, less than half the ground was filled as only 24,464 watched another 1-1 draw. 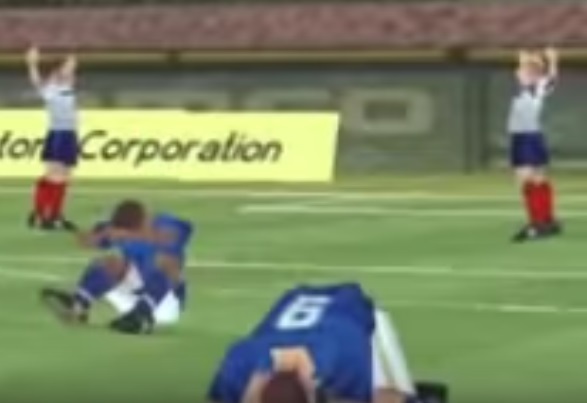 This time, after two hours of football, it did go all the way to a shoot-out. Unfortunately, Danmark’s star man Preben Elkjær was the only player to miss his spot-kick as the Spanish triumphed by five penalties to four, but his displays at the tournament earned him a transfer from Belgium club Lokeren to Italy’s Hellas Verona shortly afterwards. With some exciting games, decent football, and a lack of major trouble, the tournament was deemed a resounding success. 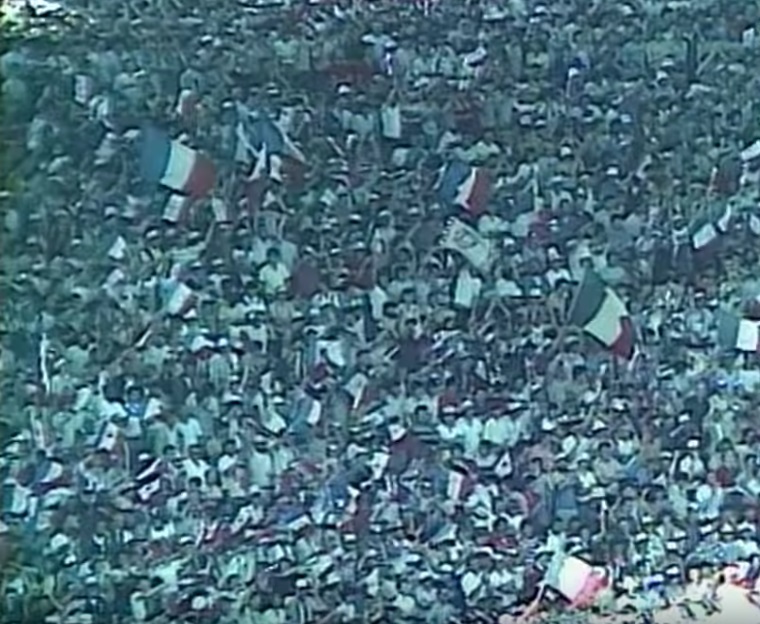 These would go on to be crucial factors in France’s bid to host the 98 World Cup, which would turn out to be scene as they next won a trophy in the exact same stadium – fittingly wearing a tribute shirt to the 84 design. 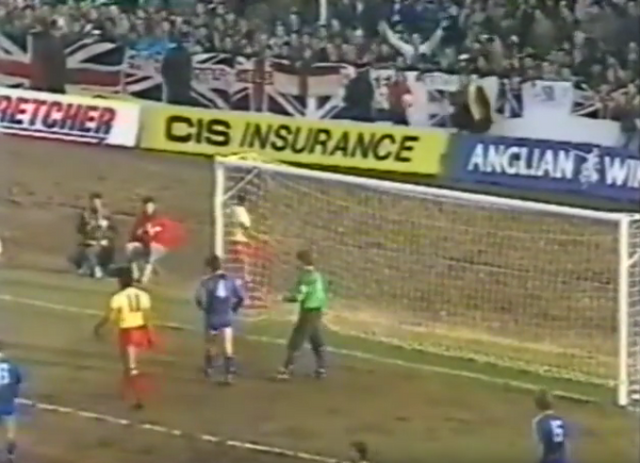 But worryingly, unlike 1984, this time the English were coming. 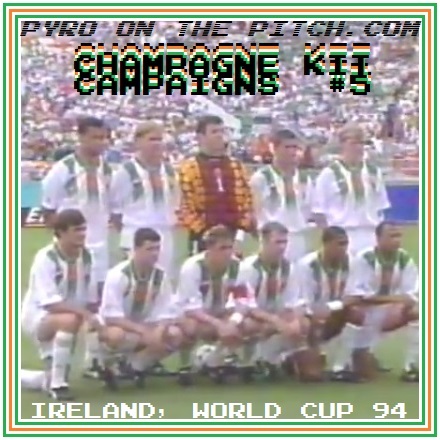 After the previous edition of Champagne Kit Campaigns, in which the Irish Republic’s road to USA 94 was examined, we continue with a sort of part two to that story by going on to the tournament itself. While a second round exit meant that not TOO much champagne was warranted (enough will have already been drank after the first game), it would be a historic time in terms of the strip, as Ireland played their last match to date wearing Adidas. Thanks to world-renowned kit dealer Barry Rojack for some invaluable information. 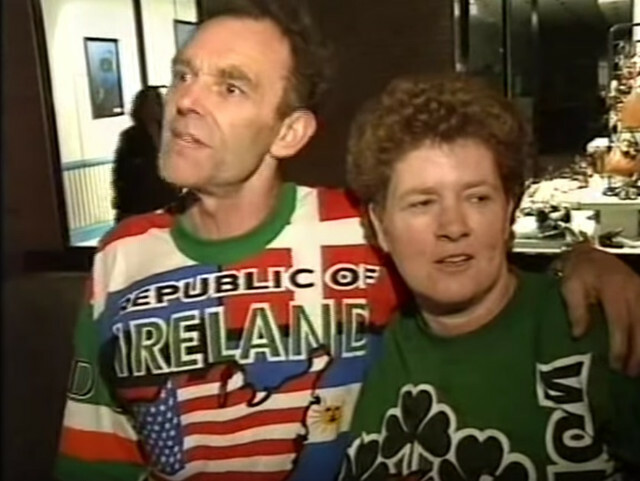 For a full background on what was worn by Ireland leading up to 1994, of course check back to the aforementioned CKC#4. 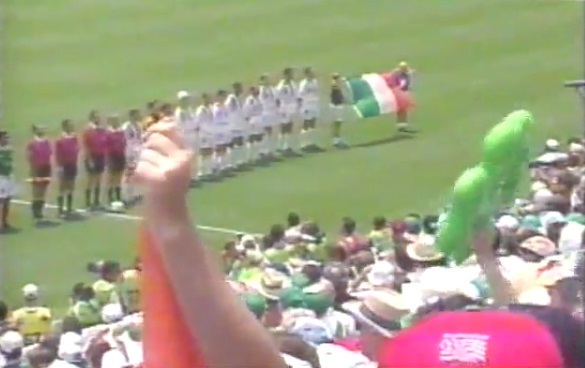 But briefly, having started the qualifying campaign still in a 1990-style “trefoil and stripes” design (with an updated crest), most of the matches saw the Irish wear the popular Adidas “Equipment” shoulder bar template in 92 and 93, with all but one in the traditional green shirt/white shorts/green socks combination. 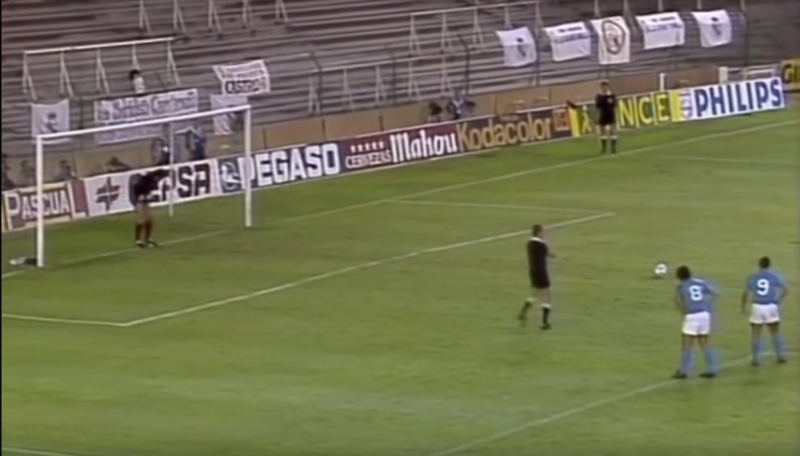 The odd game out was the historic last qualifier away to Northern Ireland in Windsor Park that secured a place at the finals, a result matched by the equally fantastic reverse strip. 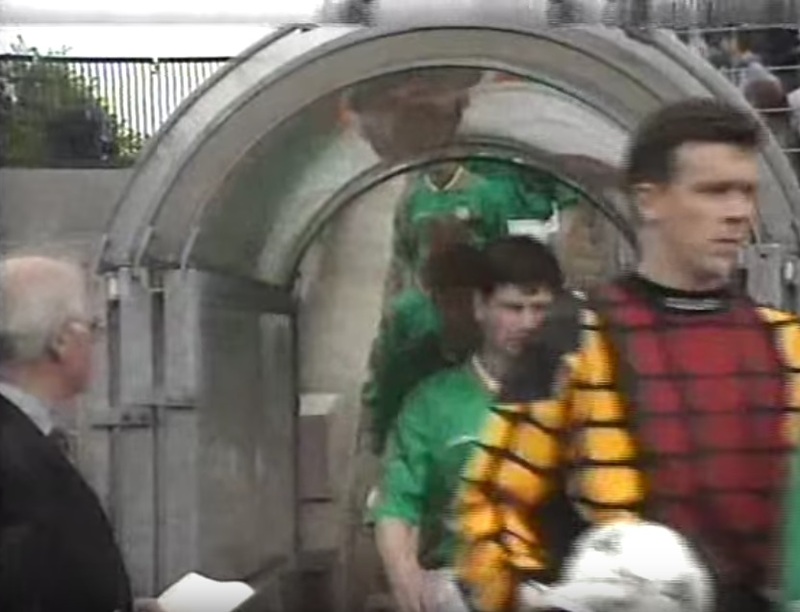 Ireland's Adidas "Equipment" away kit in it's one and only appearance, worn vs Northern Ireland, World Cup qualifier, 17/11/1993. The trefoil had been appearing on Adidas kits since the early 70s and even continued to be used by some “behind the times” nations past 1994. It’s Equipment-era successor, on the other hand, initially appeared to have an extremely short lifespan in comparison, with the bars logo first appearing in 1991 and, for the most part, disappearing by 94/95 (later resurrected sans-Equipment branding for World Cup 98). 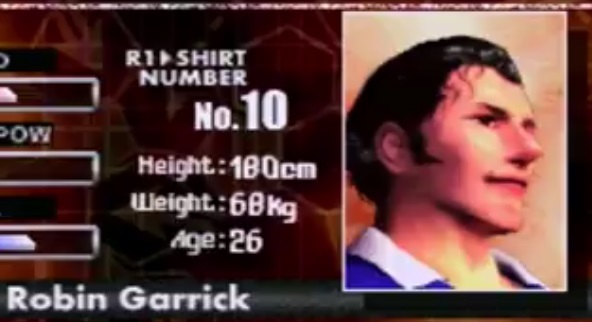 The French foreshadowed the forthcoming change of general direction by already dropping the element from their Equipment shirts in mid-1993, with an enlarged “adidas” wordmark remaining, giving it only little more than a year. 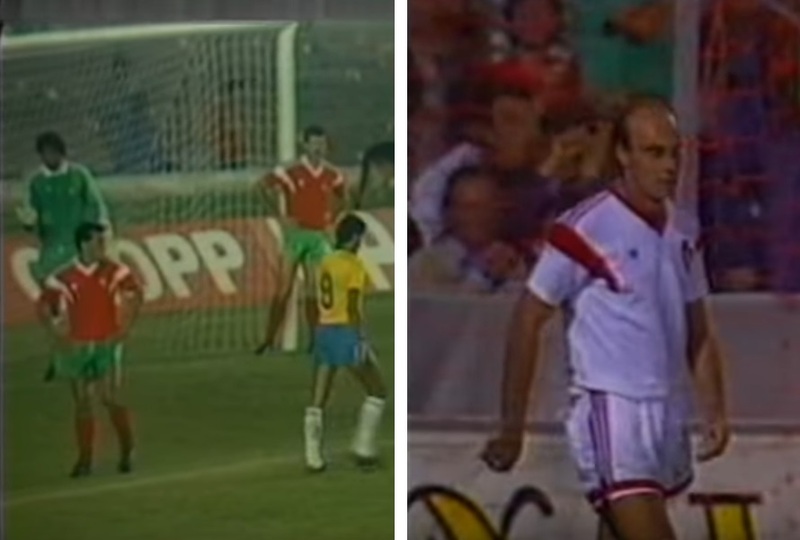 French Adidas "Equipment" away shirt on the left, already without Equipment logo in August 1993 (vs Sweden), contrasted with Portugal shirt with trefoil still being used in November 1994 (vs Austria). 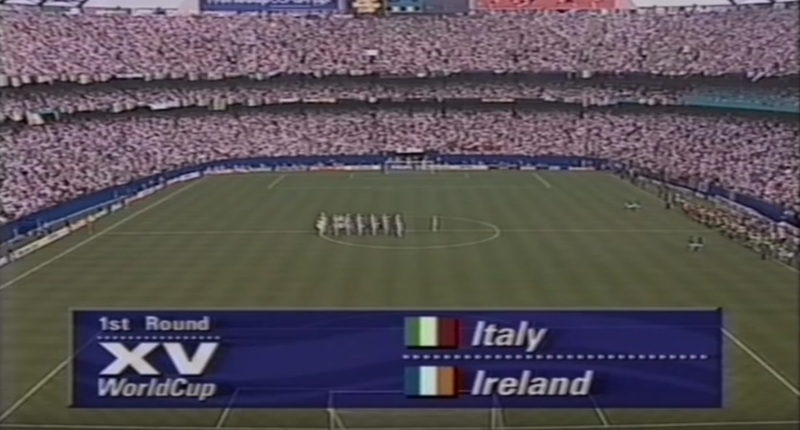 Ireland were in a similar position due to their non-participation at Euro 92 – presumably the reason for their late adoption of the style. 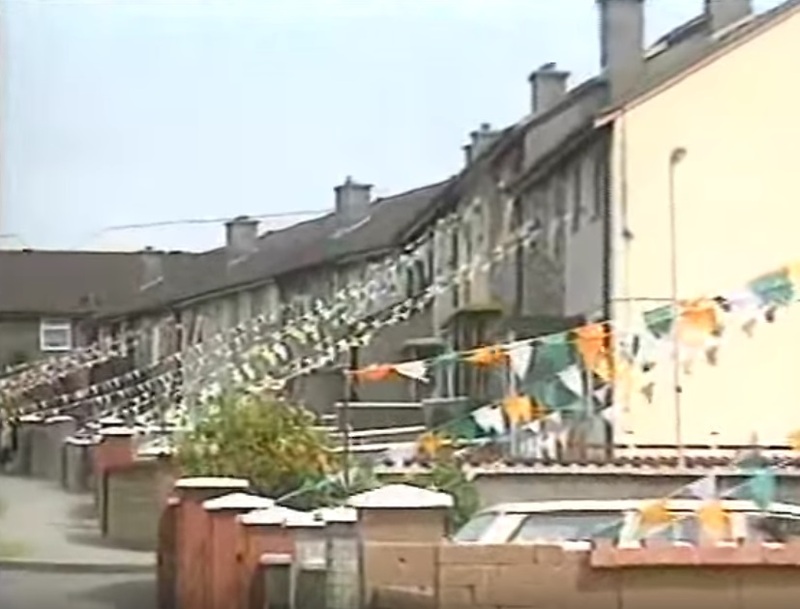 It would only be fourteen months from their first game in the new attire against Latvia in September of that year, until the “all-Ireland” clash in November 93; a relatively short time compared to the seven years that the trefoil had been seen on Irish shirts. 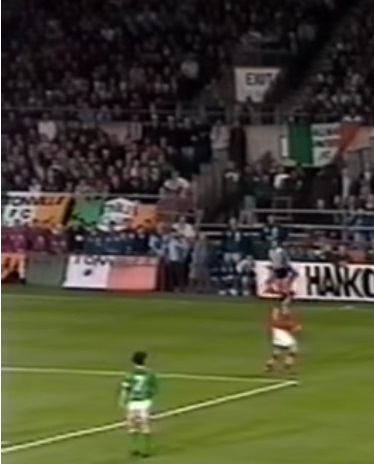 The countdown to the World Cup began on March 23rd, 1994, when Russia came to Dublin’s Lansdowne Road for a friendly, with the away side in a kit familiar to those who have read CKC#3. 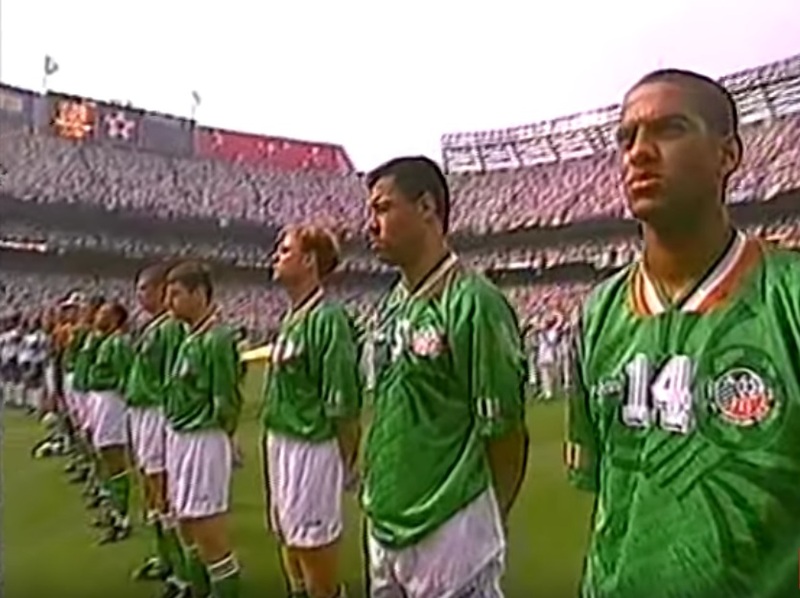 Most importantly though, it was the first chance for the Irish public to see what the team were going to wear that summer in the USA, although the game wasn’t broadcast live on TV. 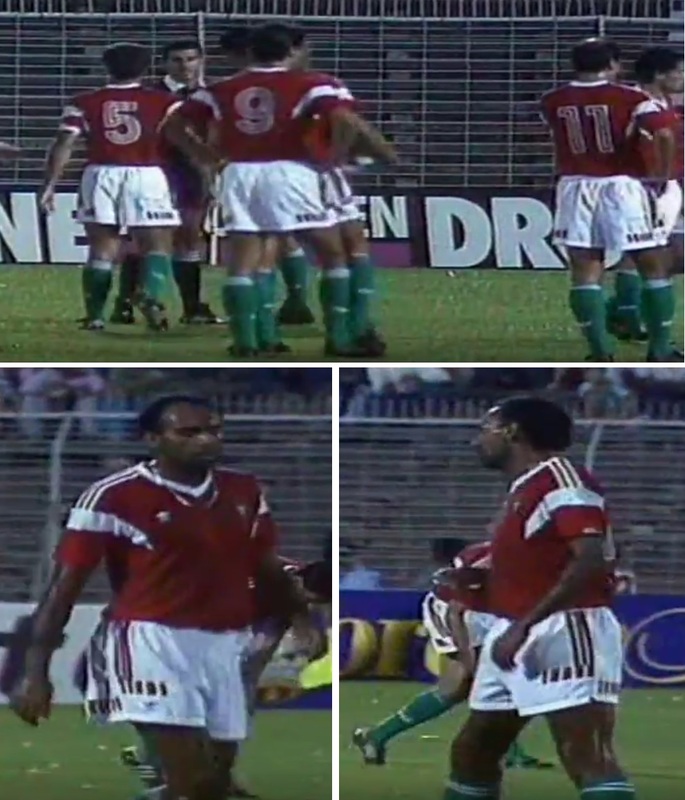 Using a brighter shade of green than the last kit, the “Equipment” motifs were indeed a thing of the past, with a lone Adidas wordmark appearing on the chest opposite the crest. But incredibly, a trefoil did sort of make it back onto the shirt in the form of the sublimated shadow pattern, that basically portrayed the FAI logo bursting through the iconic Adidas “flower”. Subtle diagonal shadow stripes also incorporated FAI insignia, while a broad green/white/orange v-neck collar was complimented by small Irish tricolours on each sleeve. 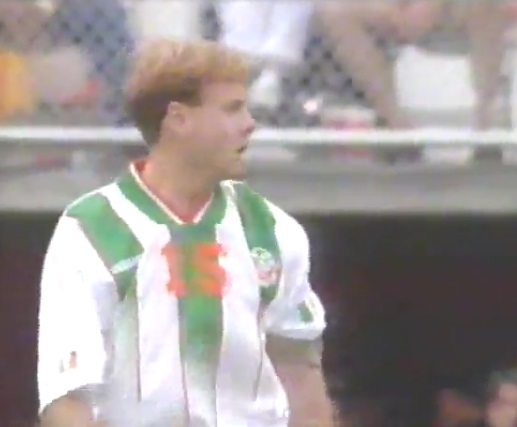 The 1994 Ireland jersey in it's debut match, demonstrated by Liam O'Brien who ultimately would not be in the World Cup squad, Ireland vs Russia, friendly, 23/03/1994. The shorts were mostly plain, but also included fabric pattern. The socks, however, were perhaps the most exciting part of the kit, due to their white turn-overs that featured green/orange/green stripes. 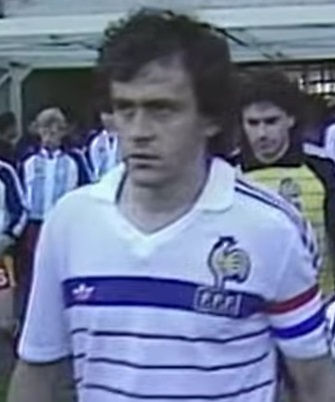 This type of “French-formatting” (as seen with blue/red/blue stripes over white French kit elements) had been employed on Ireland’s old O’Neills strips in their green/white/gold colourway, but this was the first time in the Adidas era that Ireland’s stripes weren’t a uniform white or green. 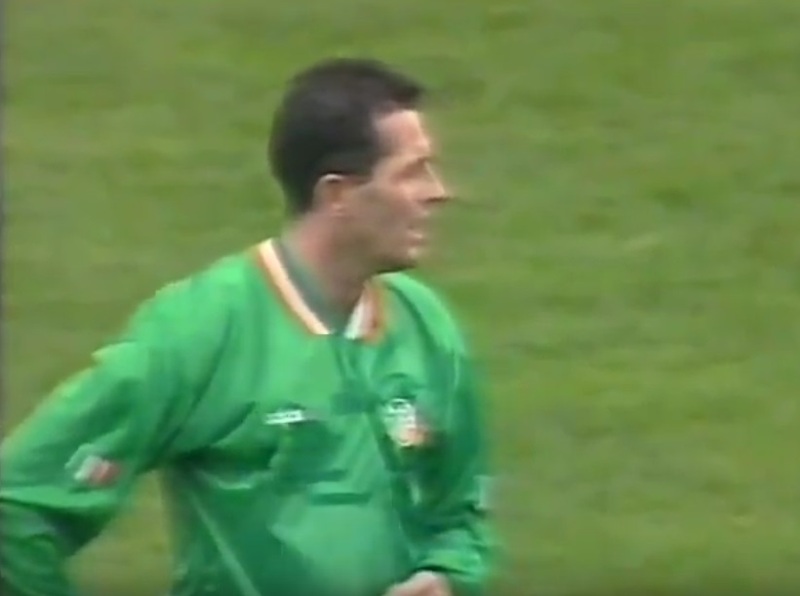 Full Irish home kit featuring green/orange/green stripes over white sock turnovers, Ireland vs Russia, friendly, 23/03/1994. At the previous World Cup, Ireland had been one of the only Adidas nations to wear a bespoke design, so the use of quite a common template afterwards may have disappointed some over-entitled fans (not us, since we love this era of templates). 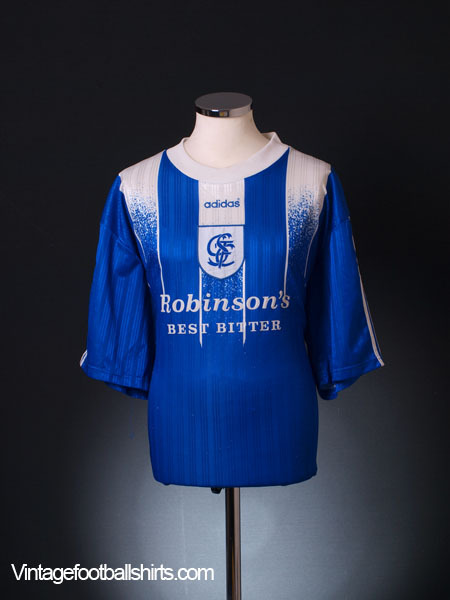 The 1994 shirt was a return to a unique kit (at least for the home, we’ll get to the away), but with quite a left-field design, it was maybe not what many had expected or hoped for. 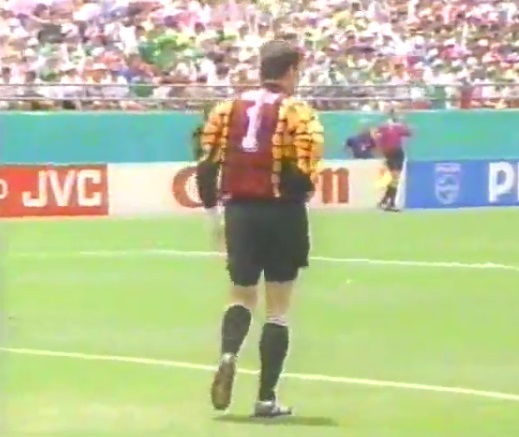 One source of continuity that hung on for now from the Equipment period was the numbers on the back, featuring an outline and three diagonal stripes in the corner. 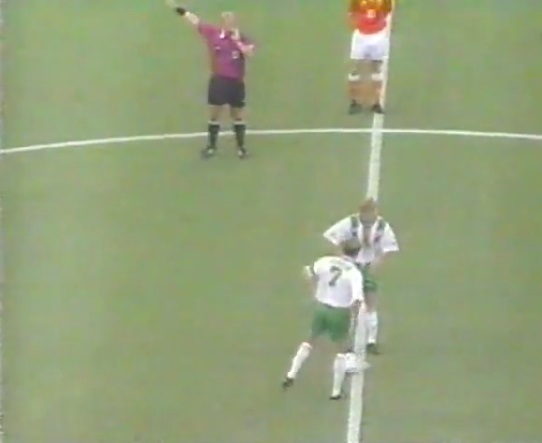 The diagonal stripe numbering style first seen on Irish kits in 1991 retained for the new shirt, and Russia jersey, Ireland vs Russia, friendly, 23/03/1994. 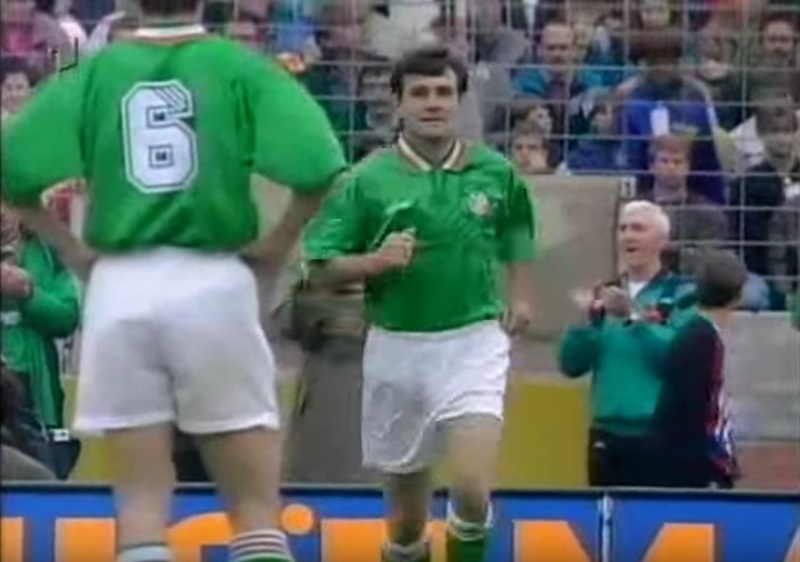 As the 90s had progressed, the tight-fitting shirts of the last decade were replaced by looser, baggier cuts and longer shorts, as demonstrated by Ireland’s transition from trefoil to Equipment. 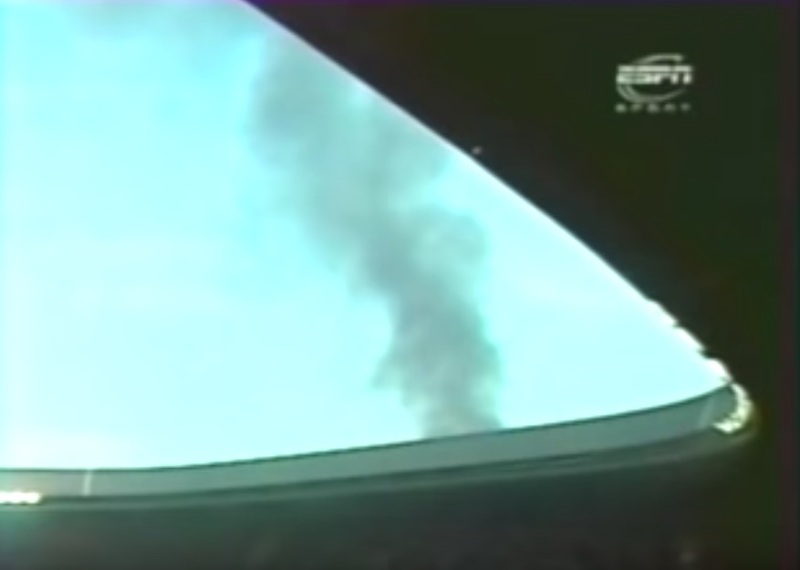 But the location of the upcoming World Cup, and it’s devastating heat and humidity, gave another reason for a massive jersey besides style: ventilation. 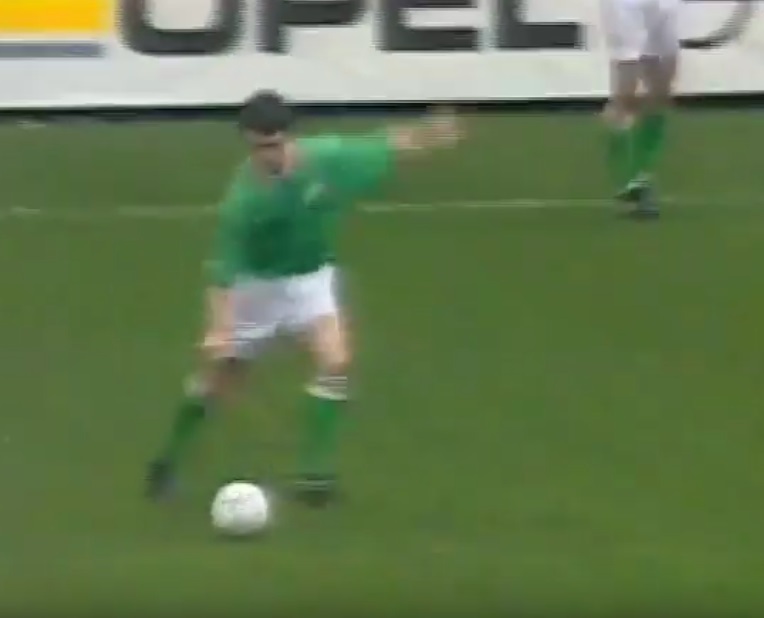 In the Russia game, the deliberate airiness of the new Ireland shirt was demonstrated by 19 year old debutante Gary Kelly especially, wearing the long-sleeve version which incidentally featured plain green cuffs. 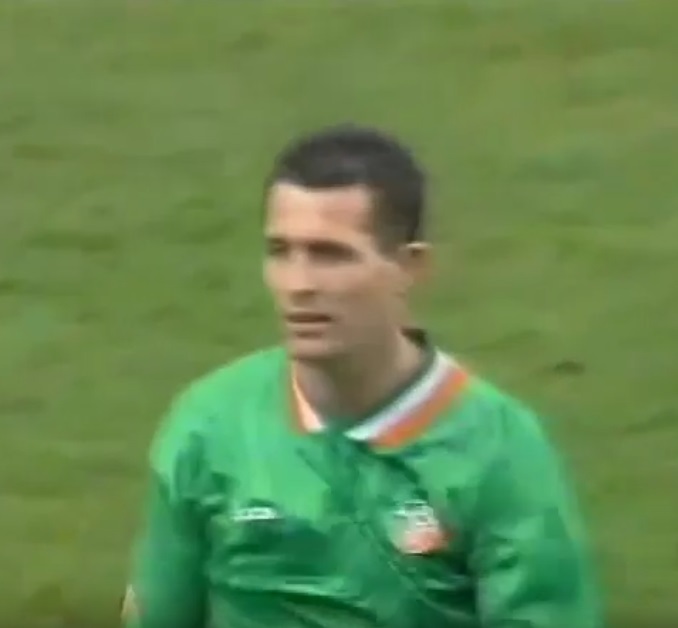 Gary Kelly in his debut international wearing the long-sleeve version of the new home shirt, Ireland vs Russia, friendly, 23/03/1994. 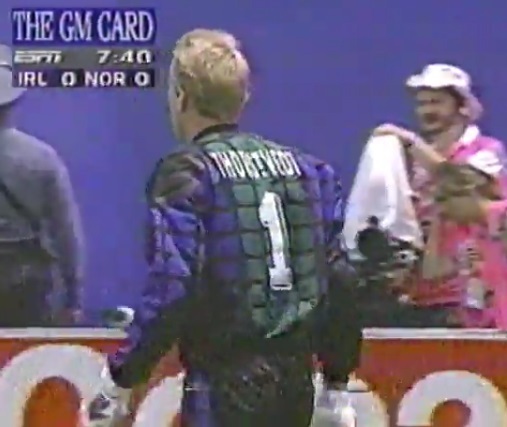 New kits were introduced for the goalkeepers also, but, unlike the outfielders, they would be wearing a standard template known as “Predator” worn by many net-minders at the time that featured visible shoulder pads. “Blocks” of yellow and maroon on a black background covered most of the first choice jersey, with an “adidas” positioned on the round-neck collar and a central crest beneath. 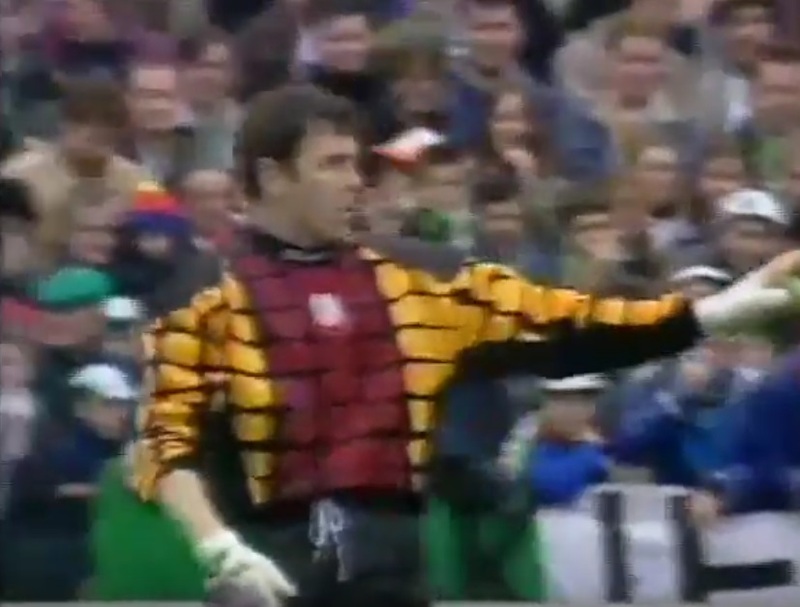 Packie Bonner in Ireland's new goalkeeper shirt, Ireland vs Russia, friendly, 23/03/1994. 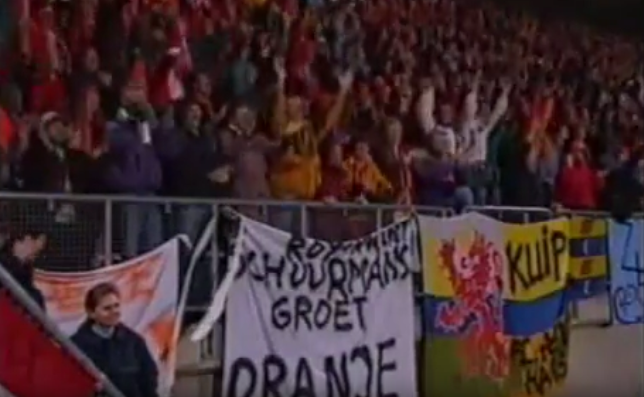 A 0-0 draw against the Russians was followed by an excellent 0-1 victory away to the Netherlands in April. 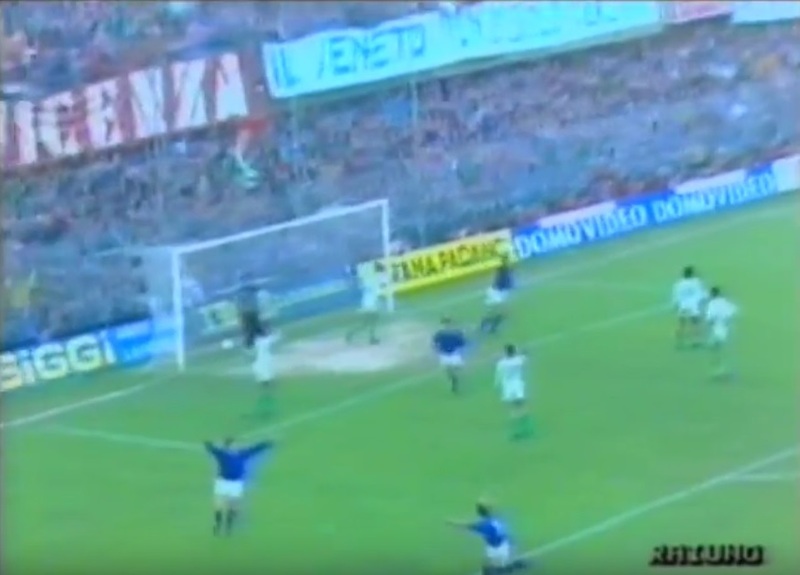 The form continued to look good in May with a 1-0 win over Bolivia in Dublin on the 24th, and an even better display than the Dutch game with a 0-2 defeat of world champions Germany in Hanover four days later. 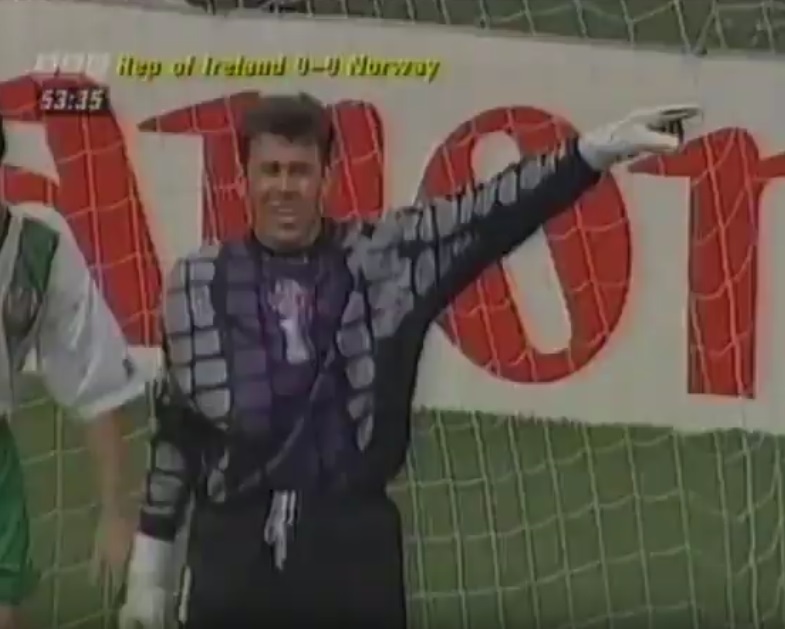 Throughout all these games the standard home kit was used, but strangely the goalkeeper shirt of Alan Kelly didn’t feature a crest for Germany game (if not the other two also) having initially been seen on Packie Bonner’s version against Russia. 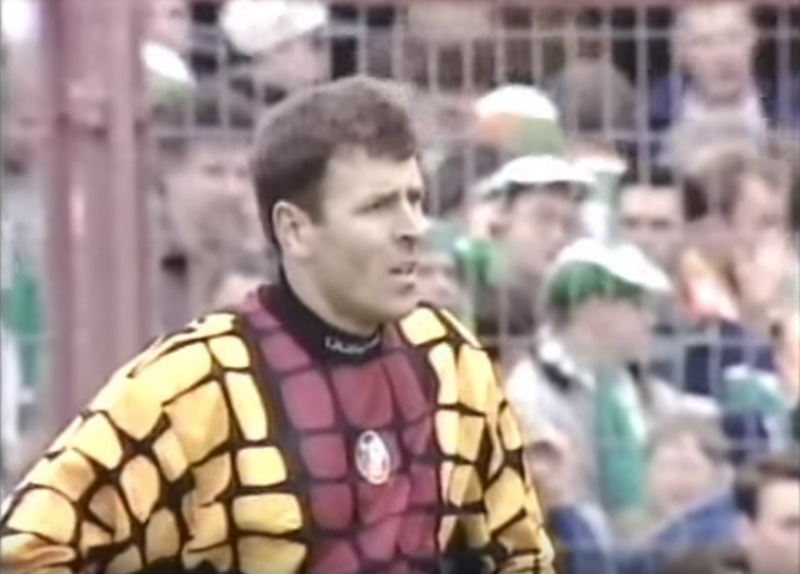 Ireland kit, front and back, above, and Alan Kelly's crestless goalkeeper jersey below, Germany vs Ireland, friendly, 29/05/1994. The last warm-up fixture was on June 5th at home to the Czech Republic, who had most recently been part of the Representation of Czechs and Slovaks for a failed qualifying campaign and were now on their own for the first time. 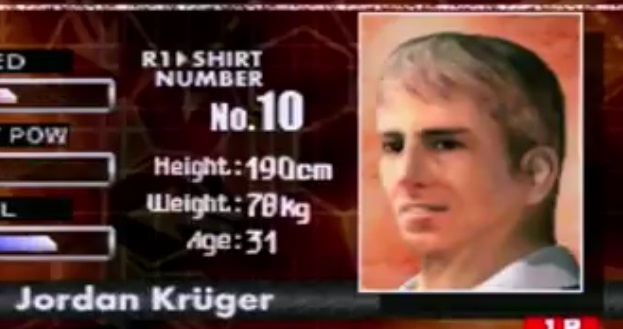 In a game most noteworthy for the away team’s rarely seen early Puma shirt, the class of the side that would burst onto the world scene at Euro 96 was already evident as they soured the going away party with a 1-3 defeat. 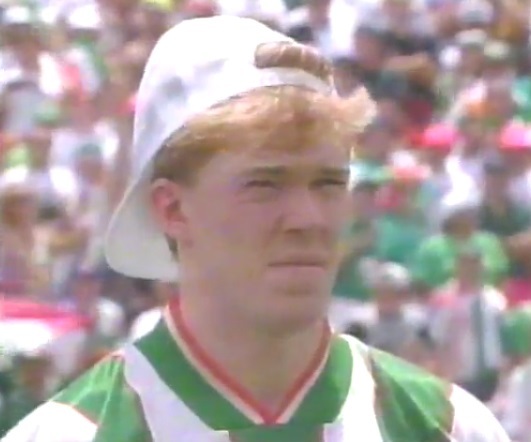 But thankfully, the crest returned to Bonner’s goalie top. 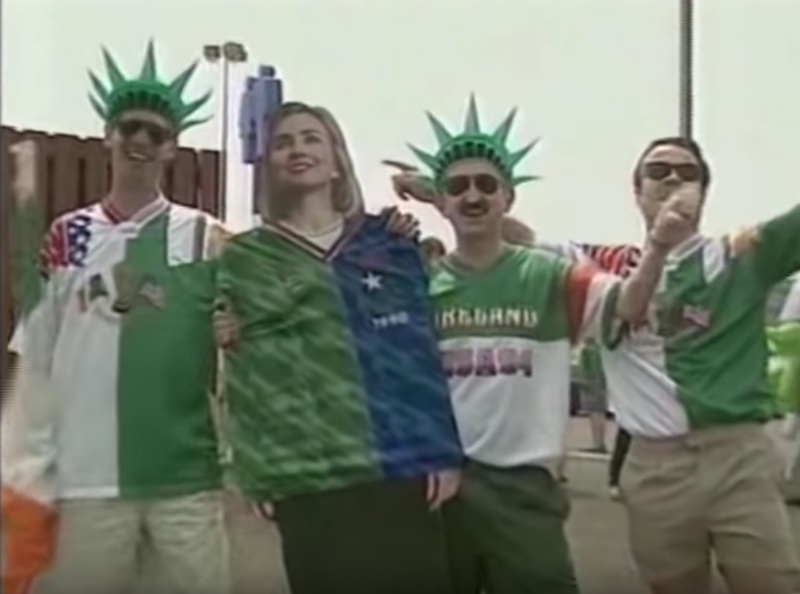 The away side cause an upset at the World Cup going away party wearing an interesting early shirt, Ireland vs Czech Republic, 05/06/1994. 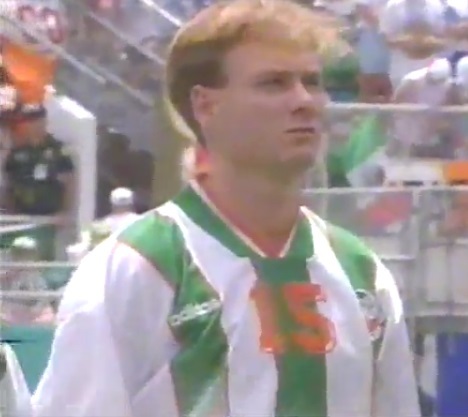 Bonner's jersey with crest reintroduced, Ireland vs Czech Republic, friendly, 05/06/1994. Despite the loss the country prepared itself for World Cup fever, blindly optimistic for a repeat of the euphoria of four years earlier. Accordingly, opportunistic companies were ready to pounce on this enthusiasm with endless amounts of World Cup Ireland-related merchandise, including “supporter jerseys”. 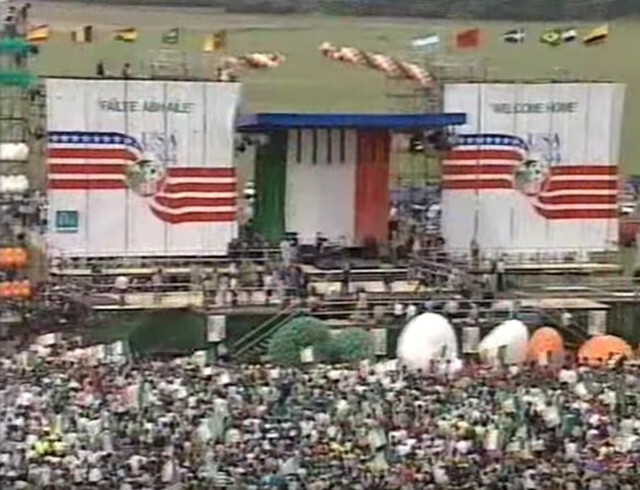 World Cup fever in Ireland with bunting, t-shirts (featuring a Denmark flag, who hadn't qualified) and O'Neills-made supporter jerseys (Hillary is modeling a 1990 Ireland/Italy version), June 1994. True to form, former Ireland kit-supplier O’Neill’s produced many of their own “Adidas inspired” versions (based in an alternative timeline where Ireland used the “Spain 1992/93” Adidas template with a 1986-92 style Irish crest, which is actually beautiful), but a new development was the appearance of hideously inaccurate counterfeit shirts that tried to pass for Adidas. Among other missteps and poor material, the “home version” most prominently featured the instant give-away of a lace-up turnover collar. 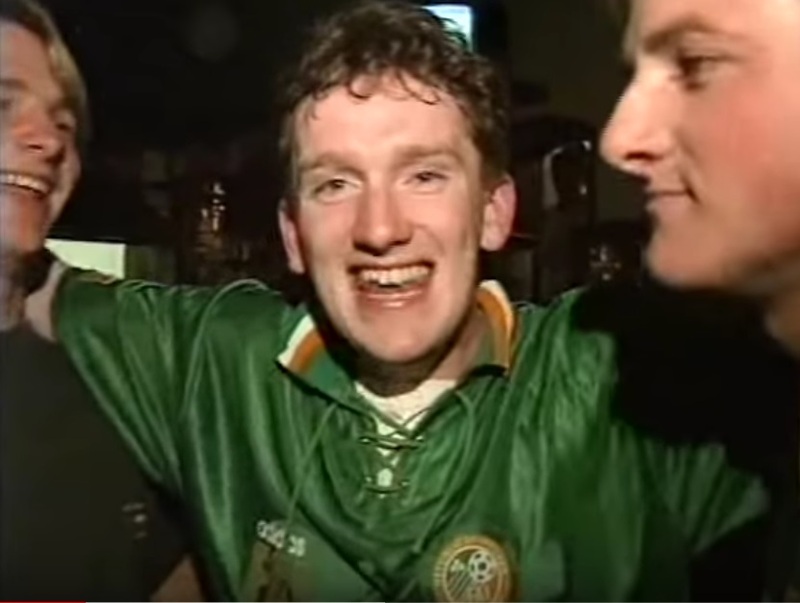 A jolly fan wearing the hideous, counterfeit "collared" Ireland jersey, June 1994. The actual official supporters replica shirts, like all Irish commercial jerseys since the 80s, could only be sold with the logo of the FAI’s corporate partner – in this case still Opel. It was a genius money-making move by the the association in which they had no problem turning their loyal supporters into walking billboards, when no other country did. 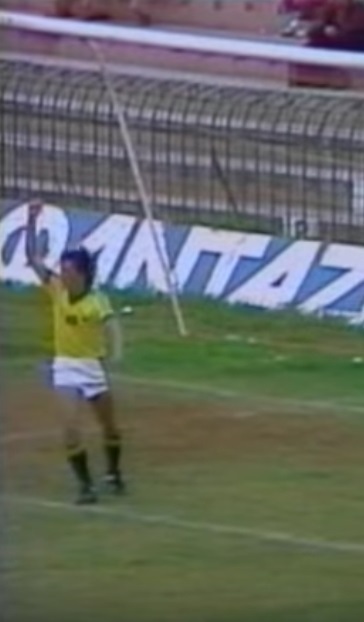 However, lucky South American and Australian Ireland fans will have had versions produced in their regions devoid of the sponsor, as Opel had no presence in those markets. Italy from pot 1 (hosts and top 5 ranked teams), Mexico from pot 2 (Africa and Americas) and Norway from pot 4 (lower Europeans and Asia). A grumpy minority lamented that it would have been better not to have qualified at all than face an early exit, but up to three teams could progress to the next round giving the aging Irish a decent chance. The World Cup 94 draw in Las Vegas at the moment Norway were selected to complete Group E, 13/12/1993. The specter of the grueling heat would also be present though, with games scheduled for daytime to suit global TV audiences and only two substitutions allowed per match. Somewhat over-cautiously, the Irish contingent brought a set of long-sleeves jerseys as well as short sleeves, but of course they would not be needed. 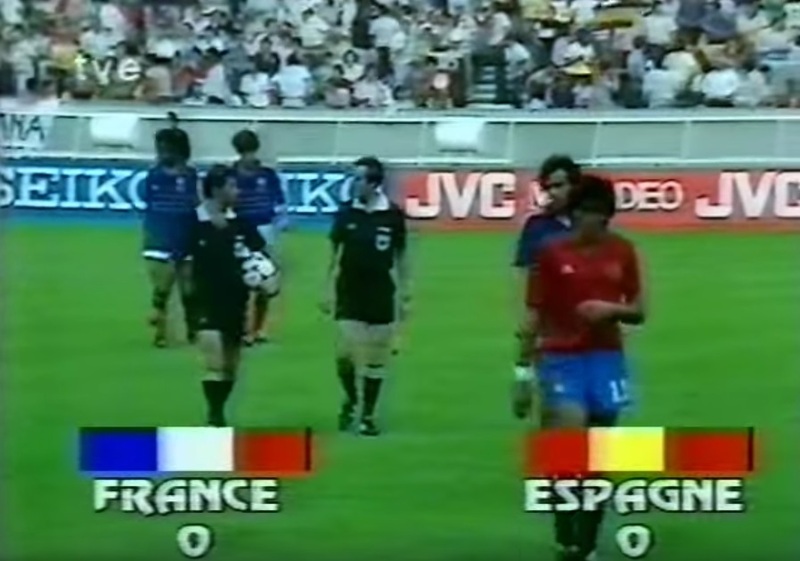 As always at the World Cup, kit distinctions were also more strictly enforced, meaning interesting kit mash-ups were certain. 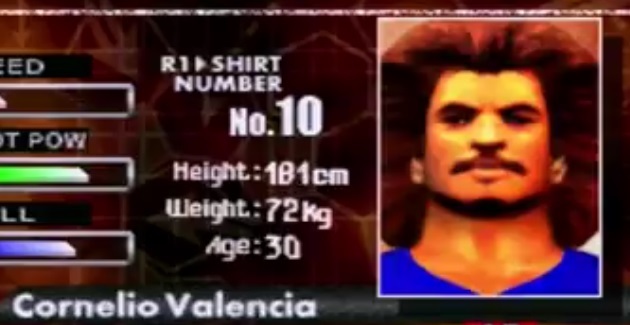 And rules against excessive corporate branding meant that certain kit-maker related elements sometimes had to be subtly changed for the tournament. 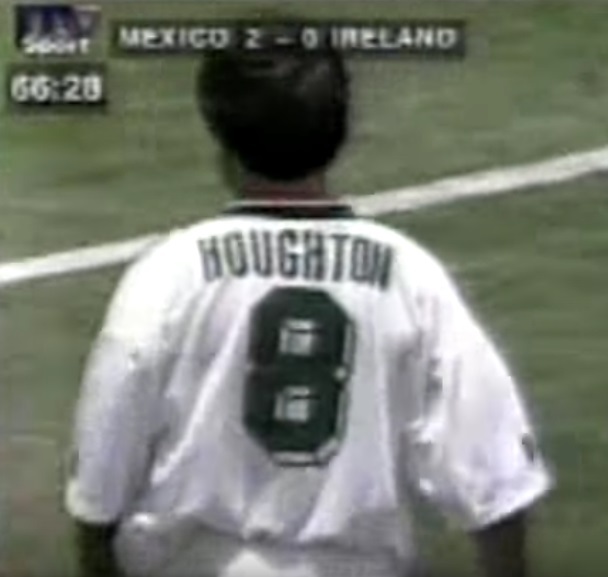 The Italians “white-advantage” didn’t count in the end, as Houghton’s first half goal, along with a mammoth performance from centre-back Paul McGrath, gave the Irish a famous 0-1 win. Despite any reservations anyone might have initially had after the change from the arguably more classy Equipment gear, the new Irish jersey had now been worn in victories over the Dutch, the Germans and the Italians, with clean sheets in all. Could the luck continue for the boys in green? 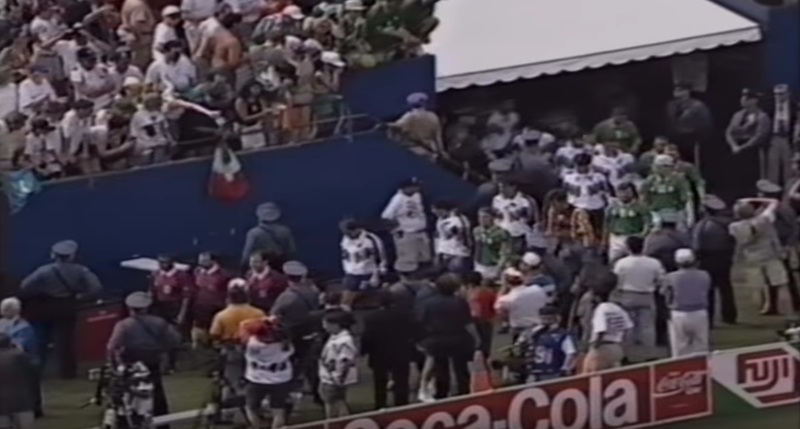 After a 1-0 loss to Norway in their first match, Mexico bounced back by taking a 2-0 lead against the hot and sweaty western European islanders (Ireland that is). 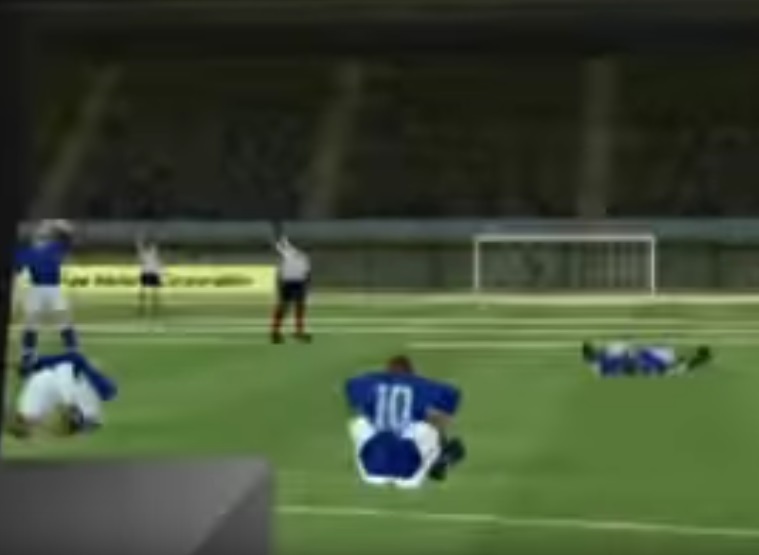 But after an infamous sideline spat that also involved a stubborn FIFA official – who inexplicably wouldn’t allow a change – and an irate Charlton, 35 year old substitute John Aldridge headed in a late consolation goal for the Irish, the goal difference implications of which still gave hope of progression to the next round. 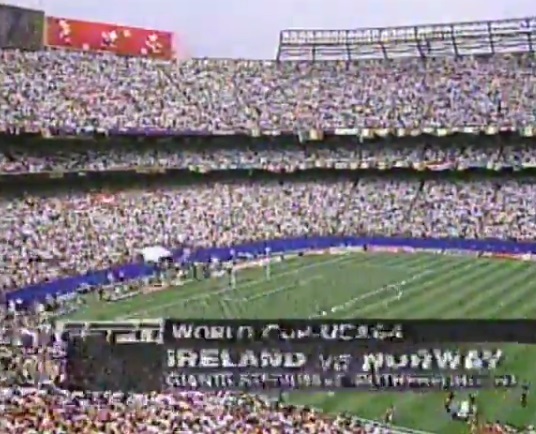 For another early kick-off, Ireland returned to Giants Stadium in New Jersey – contradictorily the home of the New York Giants American football teams. Finally the “home” side, the Irish were now free to choose any kit combination they wanted. 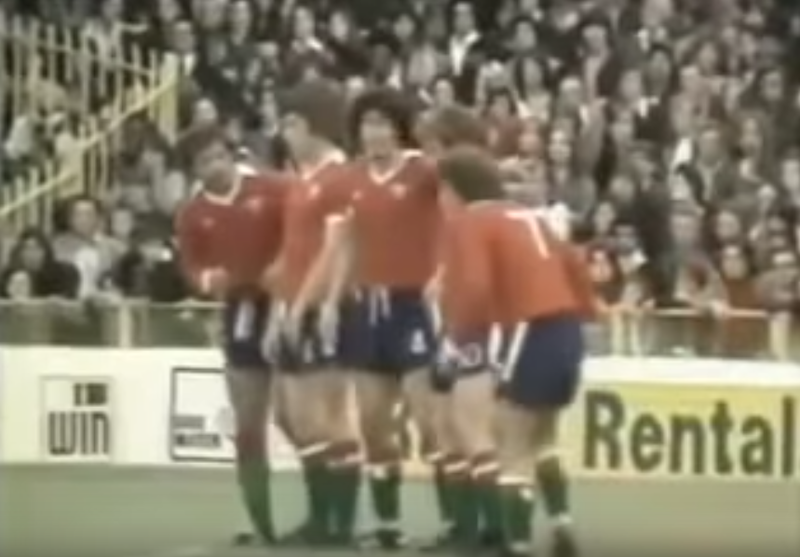 But instead of staying loyal to the colour of their country, the choice was made to follow the Italians and Norwegians example by using the away kit and taking the supposed advantage of a white shirt. After a frustrating game, 0-0 was the final score. 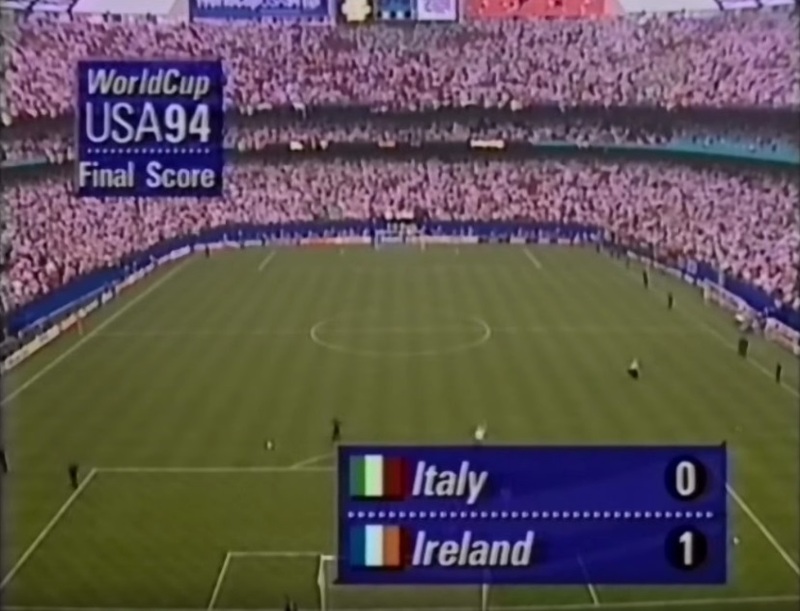 At the same time in Washington, Italy and Mexico played-out their own 1-1 draw, creating the incredible situation where, for the first time ever, a World Cup group had ended with all four teams level on points (four) and goal difference (zero). 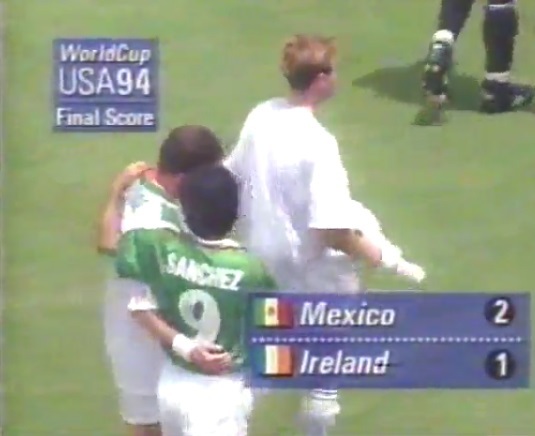 As the highest goalscorers, Mexico went through on top, with Ireland’s win against Italy and goal against Mexico being enough to send them through in second. 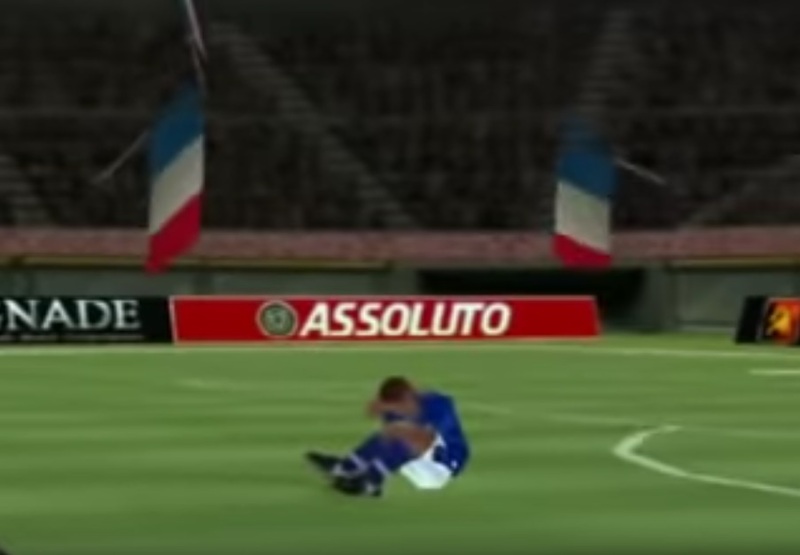 Still reeling from the opening defeat, future finalists Italy crept through as the lowest ranked third placed qualifier, ahead of the eliminated Norway who had only managed one goal. 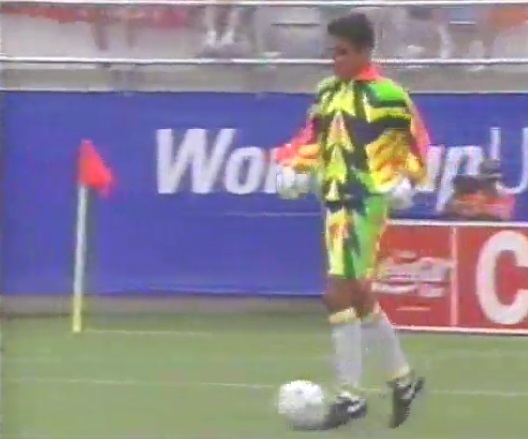 Elsewhere at the tournament, Adidas’ colourful templates would be an enduring highlight. 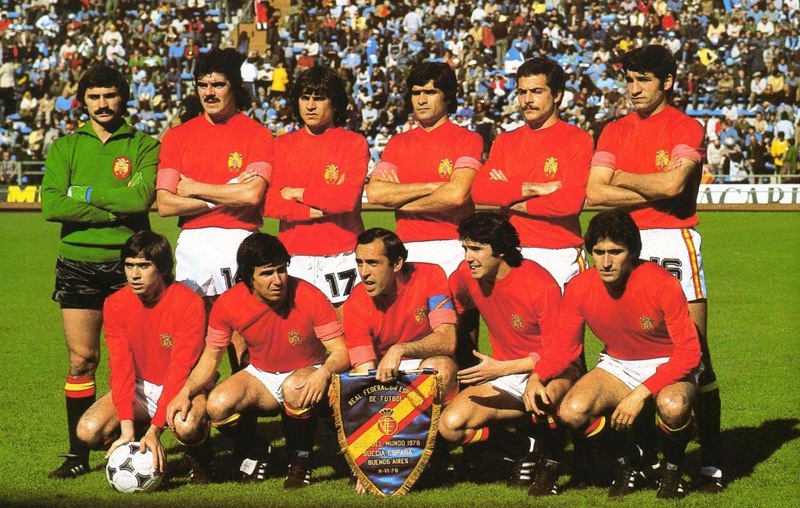 Ten of the twenty-four nations present were contracted to the brand, with Romania, Sweden (who, continuing the theme of the heat, came with a white away shirt rather than the usual blue), Bulgaria and Norway (home) using an evolution of the Equipment template that featured dual “rib bars”. The collars and cuts of these jerseys were similar to the Irish effort, with the Swedish version also even featuring diagonal shadow stripes. Above: The great Norwegian home strip used at the World Cup, which added navy raglan sleeves to the popular "rib-bars" template. "; Below: Sweden's white away kit with the same shirt template. 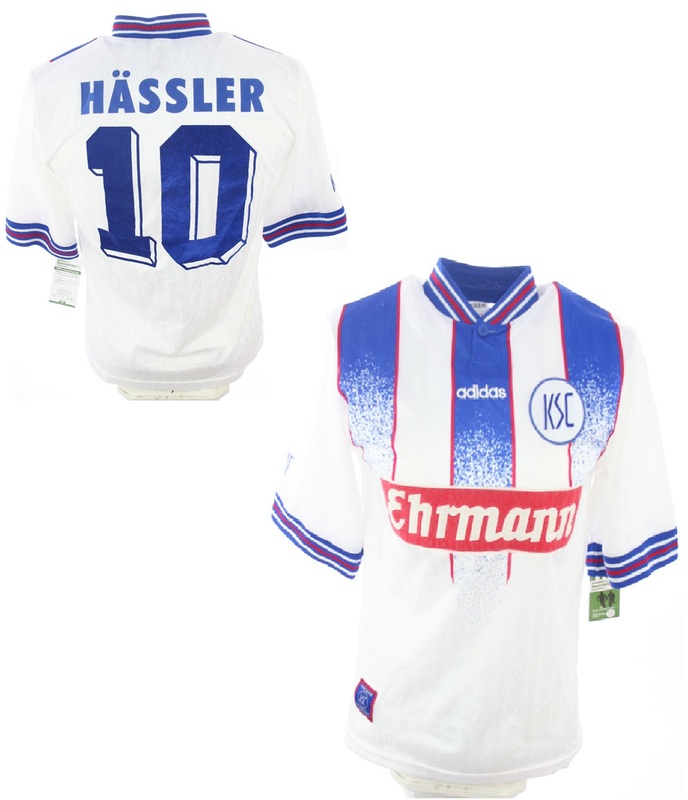 The second most prevalent Adidas theme, thanks to Spain, Argentina (away), and Norway (away), used a smarter turn-over button collar and employed columns of stacked diamonds (not to be confused with Umbro) running down the right side. 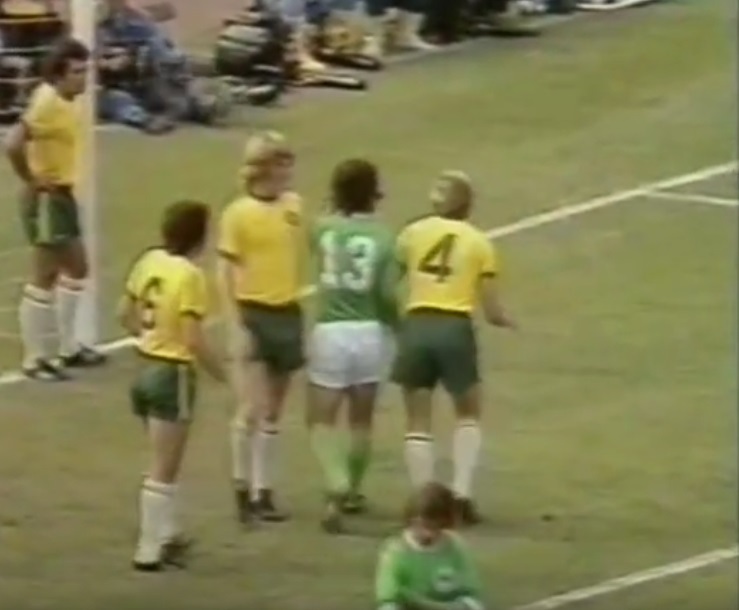 Already witnessed by Ireland in the friendly, Germany’s sensational first and second choice shirts, with their colourful diamond-flurried chests, were like the Irish away; not in design, but in at first appearing bespoke before being adopted by others. Above: Spain's "diamond-columned" away shirt; Below: Germany's first choice strip - the away did not see use in the tournament. The Irish home shirt was still joined by several other unique offerings from Adidas. 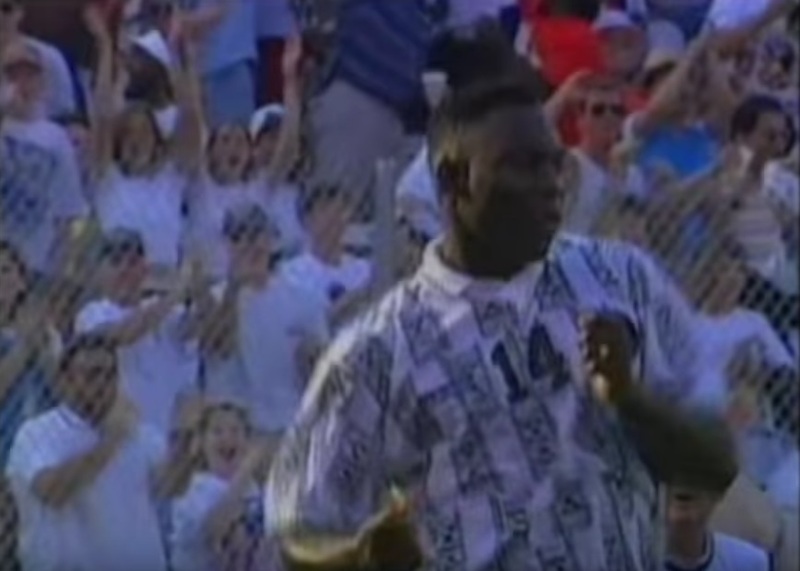 In almost all cases, however, the templates at the tournament were the superior offerings, as the four specialised USA and Nigeria kits aren’t exactly looked back on favorably. 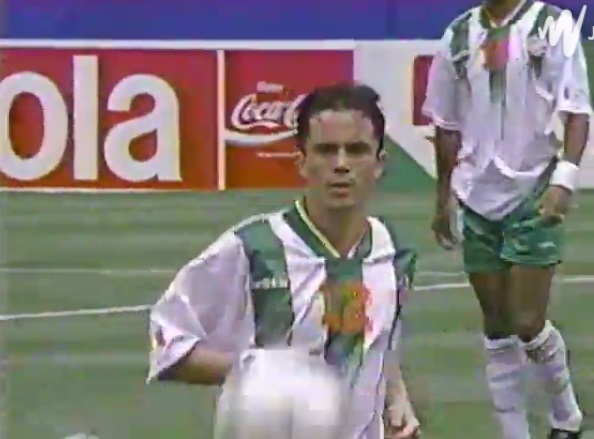 But for kit nerds, the Irish shirt could be considered the most special of all as the only outfield jersey at the tournament to (sort of) feature a trefoil. 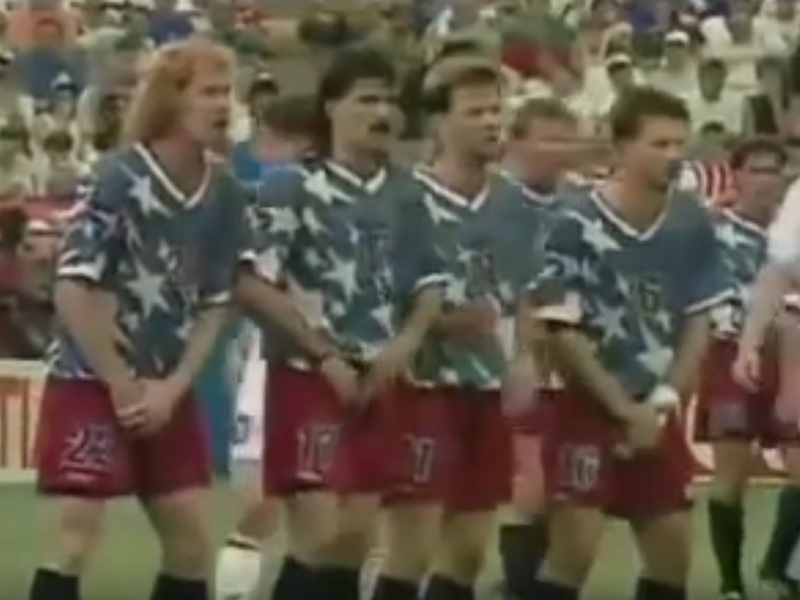 Above: The "stars" part of the USA's "stars and stripes" kits; Below: The Nigerian away shirt that looked designed for a trendy nightclub..
On American independence day back in Orlando, it was an even earlier “high-noon showdown” for Ireland against the Dutch in the next round. 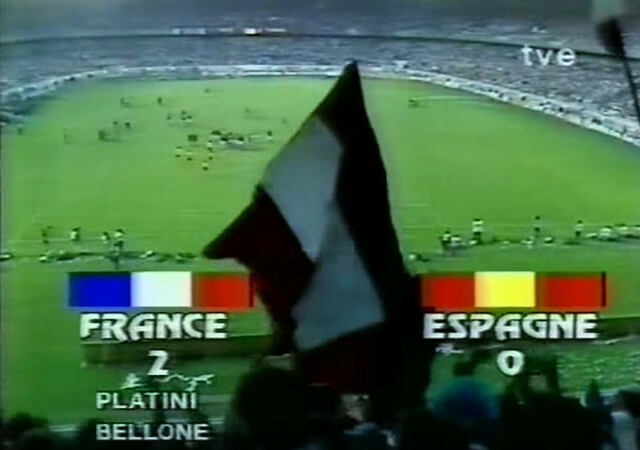 Again a replay from Italia 90, this time it would be a replay of the kit configuration too. As we have discussed, the use of white suited Ireland anyway. 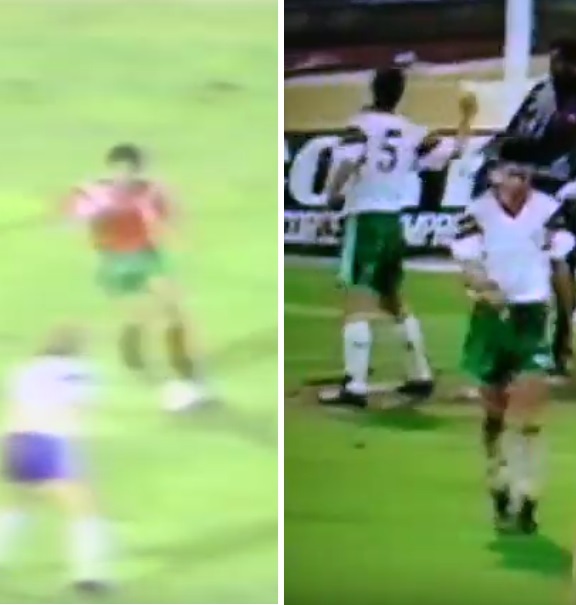 But there was concern from some at this unprecedented third game in a row without the trademark green jersey, considering the alternative had proved less successful on the pitch. 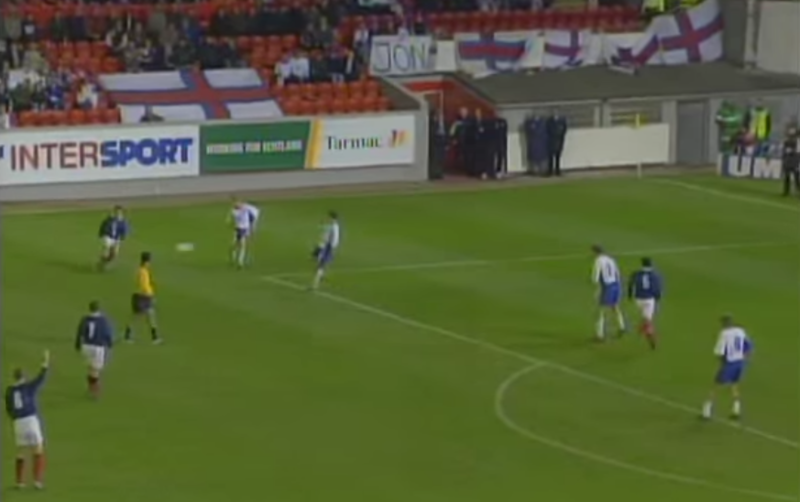 Even at the last tournament, a draw and a win on penalties had been delivered in the home kit, while the away had been used in two draws and a defeat. 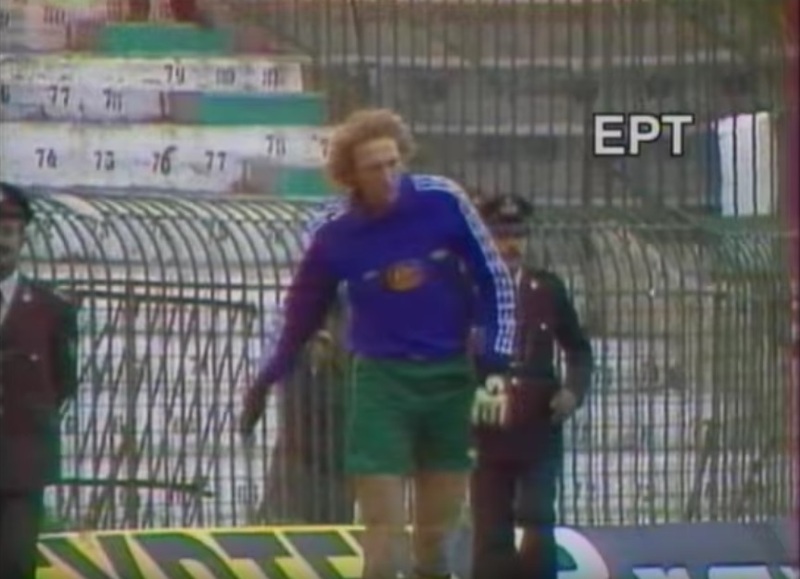 Unlike when the sides met in Italy, during which the yellow Irish goalkeeper jersey was changed only for the yellow-wearing Romanians, Bonner also used his away top once again to avoid an orange vs maroon/yellow clash. 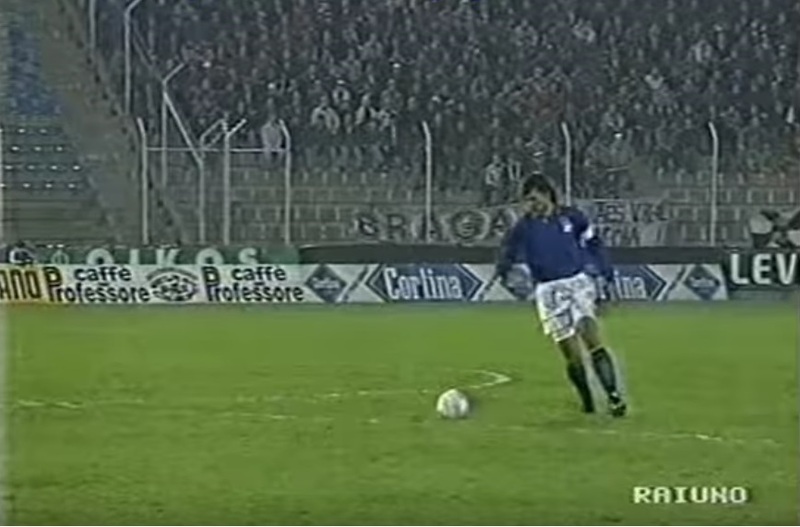 It would turn out to be his last major competitive cap (a Euro qualifier against Lichtenstein would follow), although not his most pleasant one. 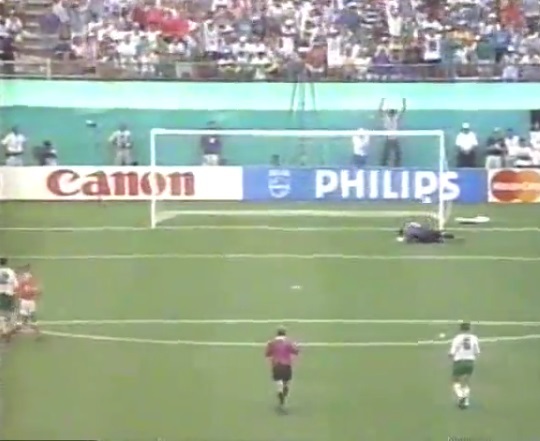 Early in the game, an error from Phelan allowed Denis Bergkamp to score, before an innocuous looking Wim Jonk strike was unfortunately palmed into the goal by Bonner. A second half disallowed McGrath effort was the closest Ireland came to a response, and they were out – the curse of the away shirt had struck again. 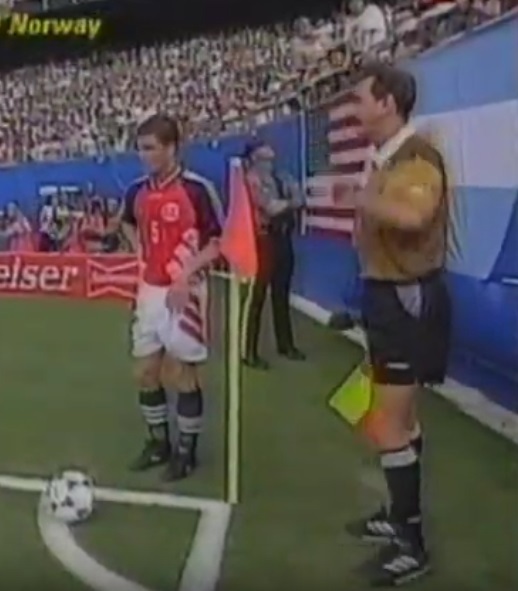 As for the kits, which is the main reason we are talking about all this, amazingly that first game back in Giants Stadium proved to be the one and only time that the ’94 home jersey (and socks) was used in a competitive setting. 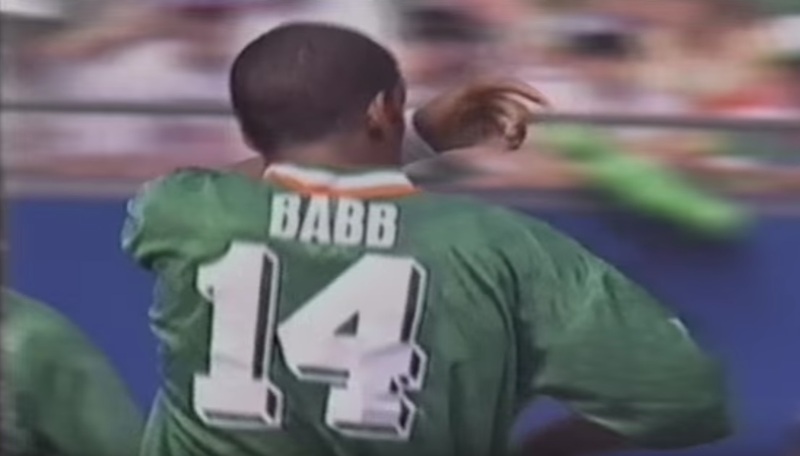 This was of course because, following the World Cup, Umbro took over as Ireland kit manufacturers, ending a relatively short eight year relationship with Adidas. 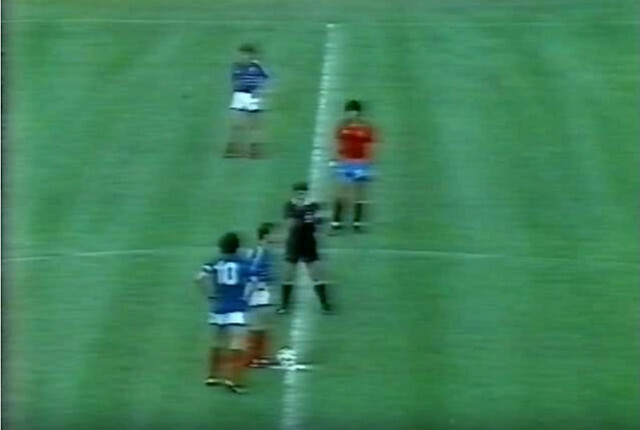 Although not the first Irish kit to be only used once in competition, the set and setting for the game makes it’s use makes comparable to the much celebrated Dutch Euro 88 shirt, which was only ever worn for the five games of that tournament (the Irish kit was used more over all thanks to the friendlies). 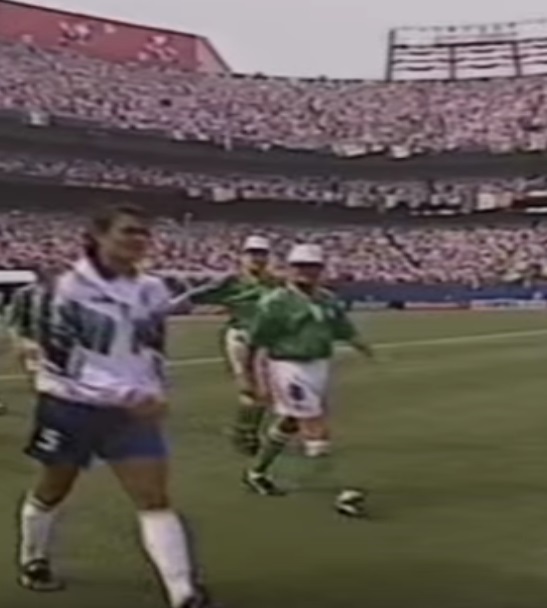 Despite the awkwardly blocky numbers, the lack of any real design elements, and the insane bagginess, the historic result against Italy (Ireland’s first win during 90 mins in a World Cup finals match) will always give this kit great meaning, and time has been kind to the concept as the 90s become more and more retro. Our regular guest slot over on MuseumOfJerseys.com is back, with installment eleven of the Cold War Classic. In each edition we usually discuss a vintage east vs west international match-up (the exception so far being Austria vs Sweden, 1973) from the Cold War era, specifically relating to the amazing and fascinating kits of the time and their evolution. Detailed backgrounds are included, and all retro kits relevant to the story are expertly illustrated in glorious colour by MOJ top boy Denis Hurley. 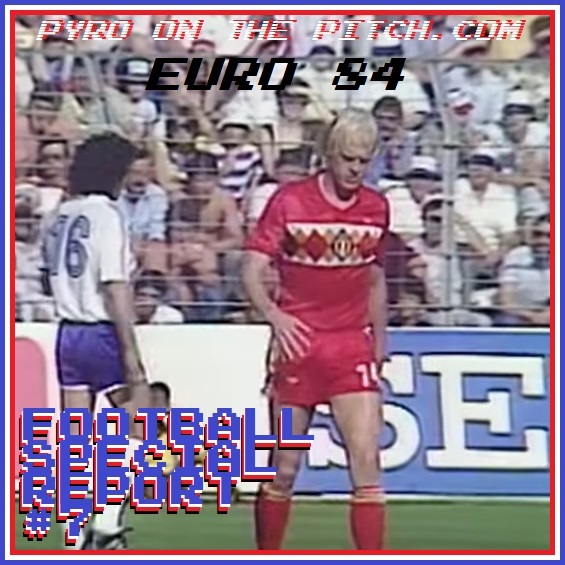 For the latest installment we look at Norway and the Soviet Union as they progressed through World Cup 86 qualification, culminating in a freezing show-down in Moscow that required extra garments. See below for a preview and link to the full article. 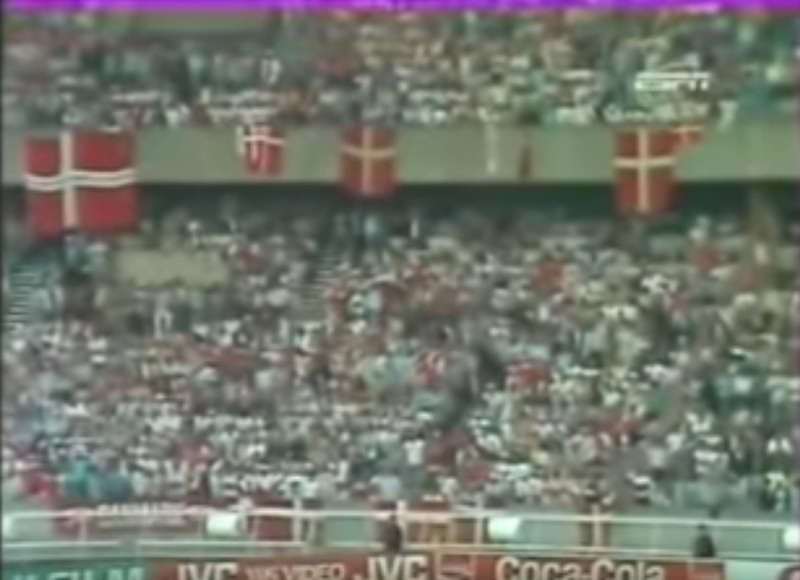 In 1984, Norway and the Soviet Union were paired together along with Denmark, Ireland and Switzerland in World Cup 86 qualifying Group 6 (see here for a look at Ireland’s many kit variations during the campaign). By modern standards, it seems a harsh, cut-throat draw for all, displaying the type of competition that existed before the introduction of many of Europe’s weaker teams – in part thanks to the break-up of the likes of the USSR. Also of major significance was that Ireland were the only side who didn’t wear red home shirts, meaning that many change kits would be needed. 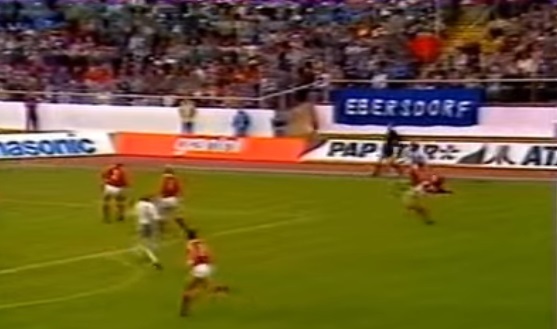 With two teams going through, the top-seeded former European champion Soviets were group favourites. 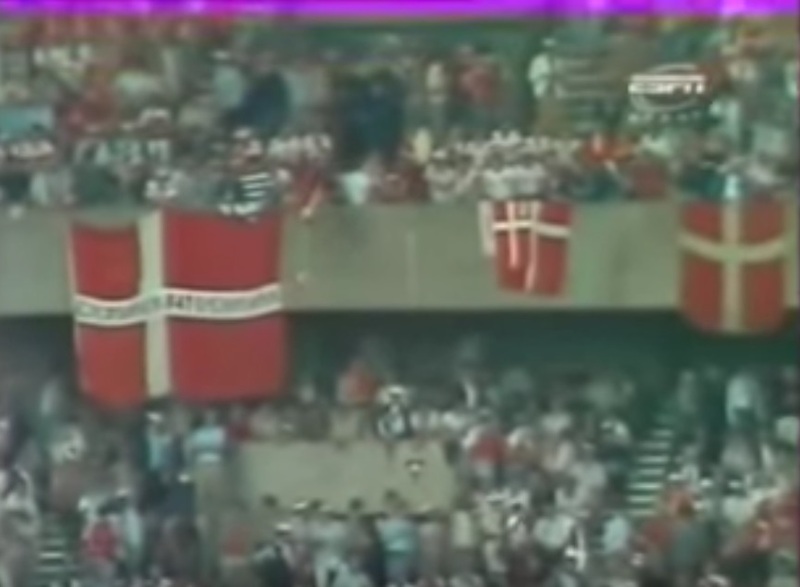 Denmark and Ireland both possessed emerging, talented squads, but neither had made it to a finals before, while Switzerland did have several tournament appearances to their name, but not since the 1960s. Still years away from their own golden era, this left Norway as the bottom side, having been drawn from a seeding Pot E (the lowest) that only also contained Finland, Malta and Luxembourg. Plunging head first into APMFVGFH time warp once again, this edition takes us to the heady days of the late 90s and early 2000s as we look at a groundbreaking series that straddled the millennia. 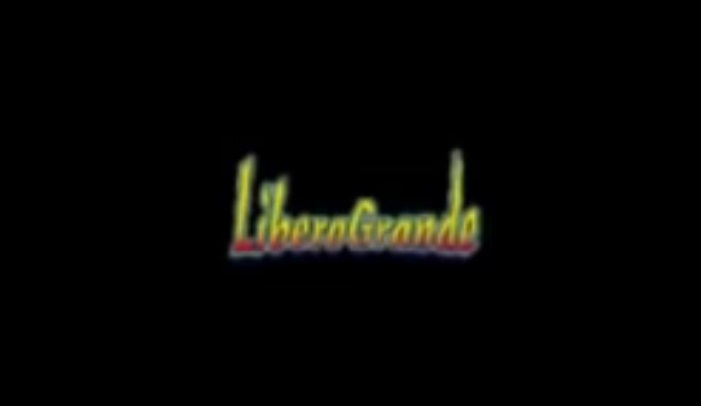 If it wasn’t clear from the blurry, vague image above, in this edition we are highlighting both LiberoGrande – released by Namco for the PlayStation in 1997 – AND LiberGrande 2: International – released in 2000. 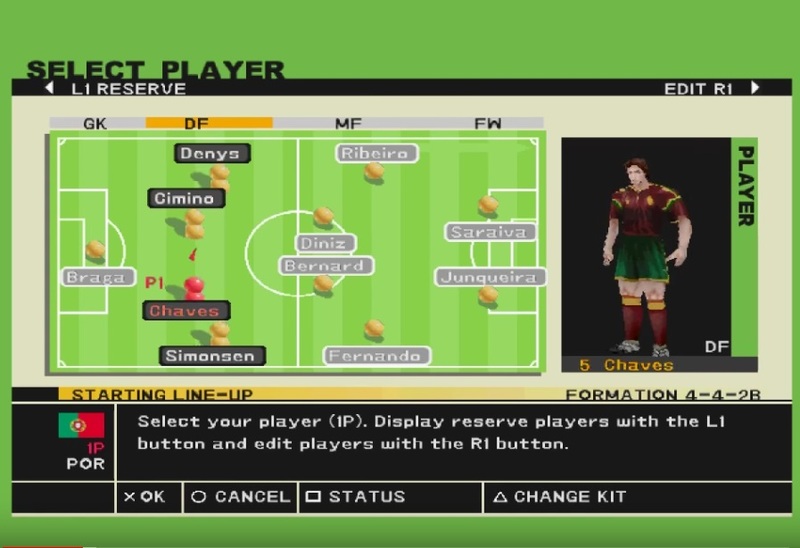 The name of the latter suggests that the series had expanded from clubs to also include national teams, when in fact national teams are all that’s playable in either game. 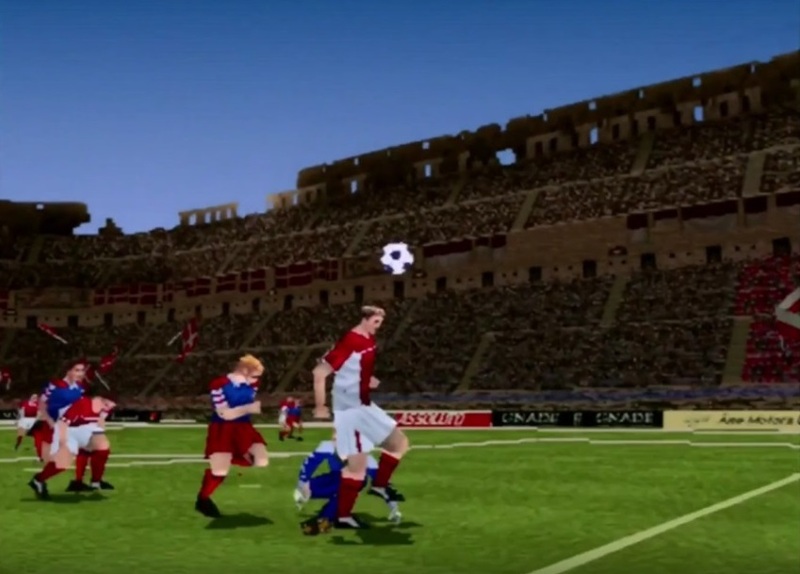 But the main point was players rather than team, as instead of playing as a whole XII and continually controlling who was on or nearest the ball, as in most conventional football games, LiberoGrande demands the gamer select one world-class player to control for the entire match. 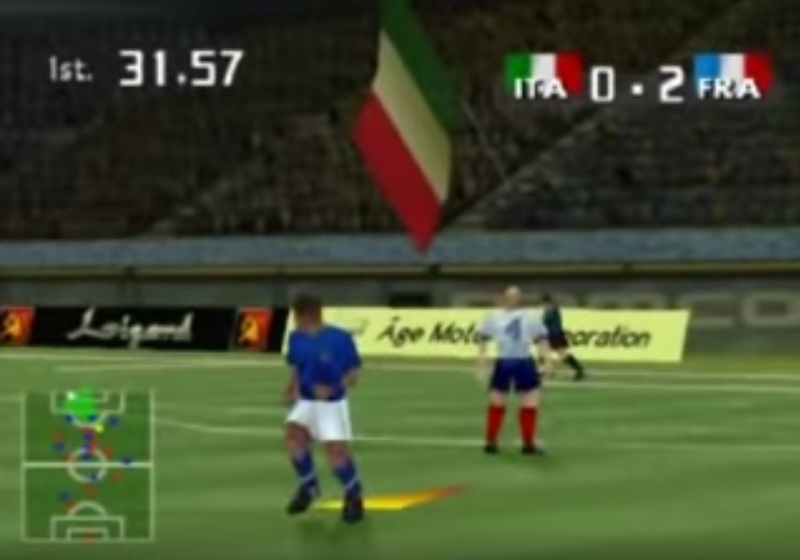 Having originally appeared as an arcade title, “libero grande” itself translates to “free big” in Italian, referring to the historic calcio position of libero (sweeper), and implying that the game gave the player more freedom than ever before. 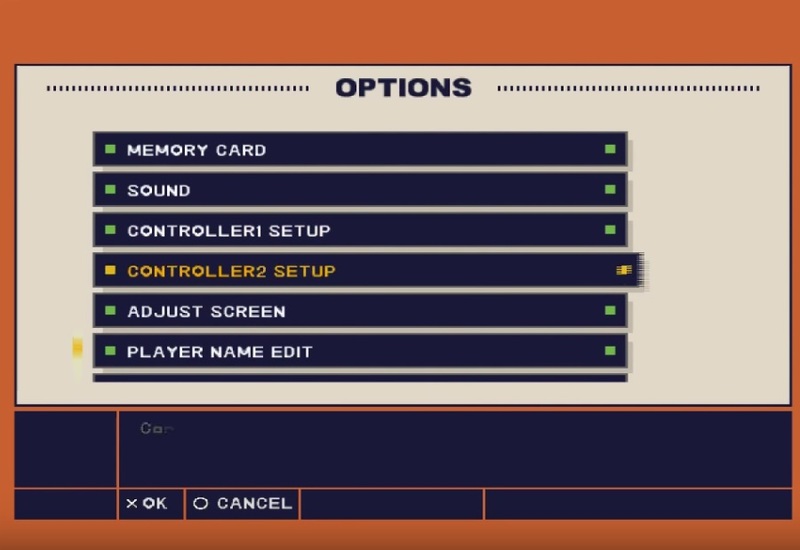 While nothing spectacular in terms of gameplay (as far as we recall), luckily we care not one jot about that in this series and over both games there are some funny and genuinely impressive moments. 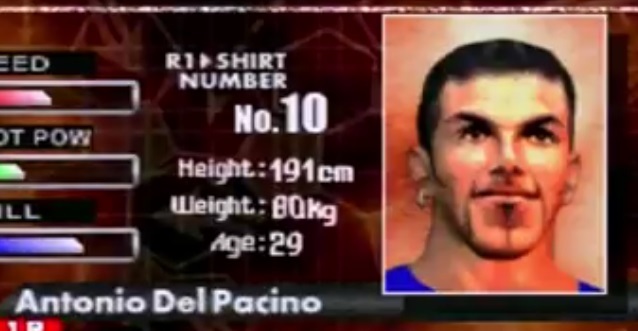 For one thing, like International Superstar Soccer the actual player’s names are not allowed appear due to licensing reasons, and the 21 playable “characters” and 10 unlockables are all parodies, often with unintentionally hilarious results. 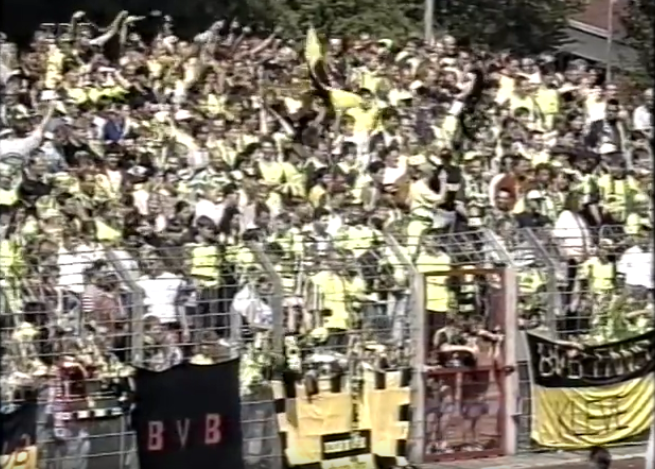 But we always love some fan action in the coded stands also, and thankfully this game provides more of it than most. 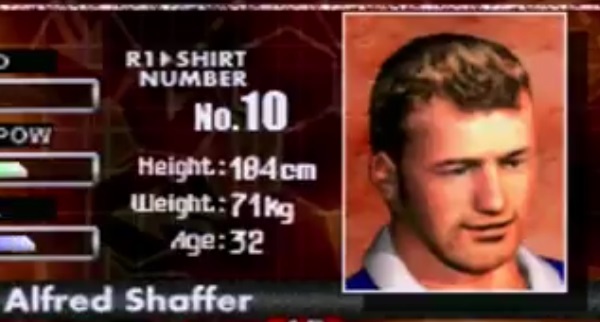 Before getting to a match, the gamer must select their player which includes a snap shot of the legend’s face. 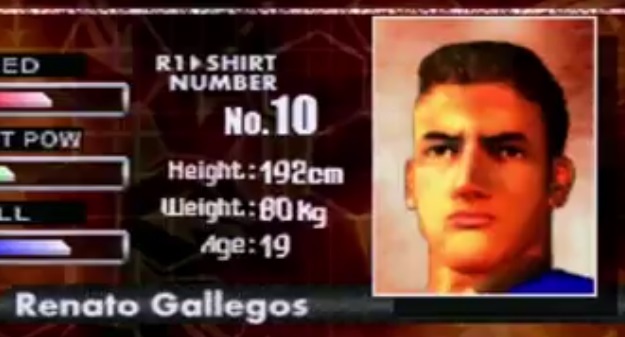 The real life equivalent of each is fairly easy to figure out, and a full list can be found on the LiberoGrande Wikipedia page, but given the Japanese origins of the game it is not surprising that many of them turn out like anime characters. 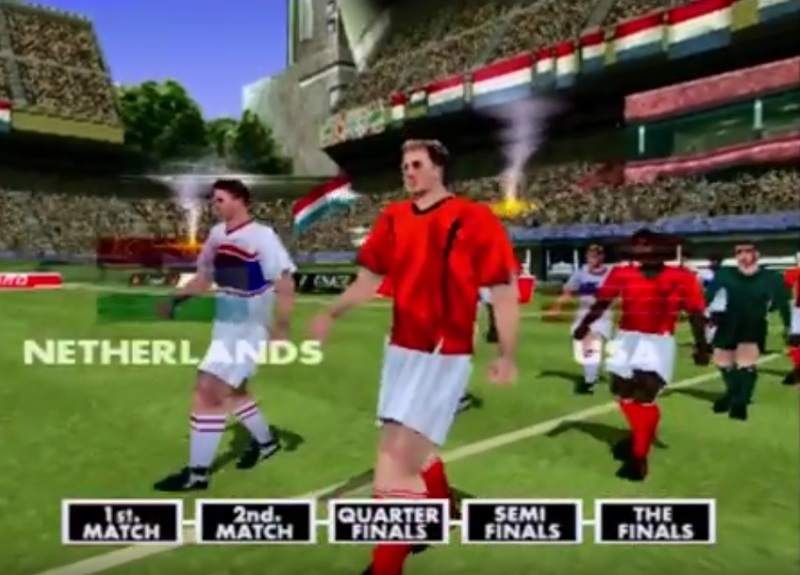 Some other interesting name choices include the combination of Oliver Bierhoff with an 19th century emperor, creating “Oswald Bismarck”; Andreas Möller going Ducth to become “Ajax Möbius”; Romario’s metamorphosis into a keyboard – “Roland”; and they transformed George Weah into “Gerald Wells”, an accountant from the American mid-west. Another sidenote from the Wikipedia page is that someone thought it important enough to include the “Flags indicate national team as defined under FIFA eligibility rules. Players may hold more than one non-FIFA nationality.” just in case the FIFA rules-audit people are skimming through old football game pages. 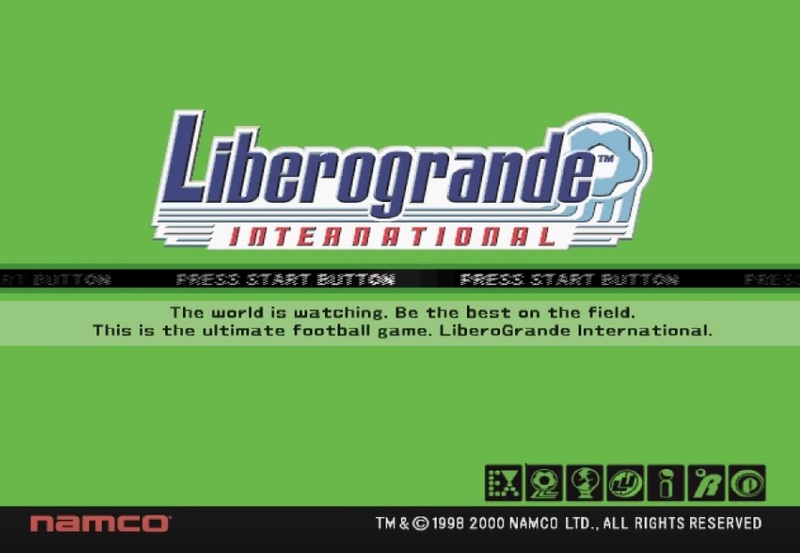 LiberoGrande 2 would not be the ultimate football game, but it would be the ultimate game in the series. 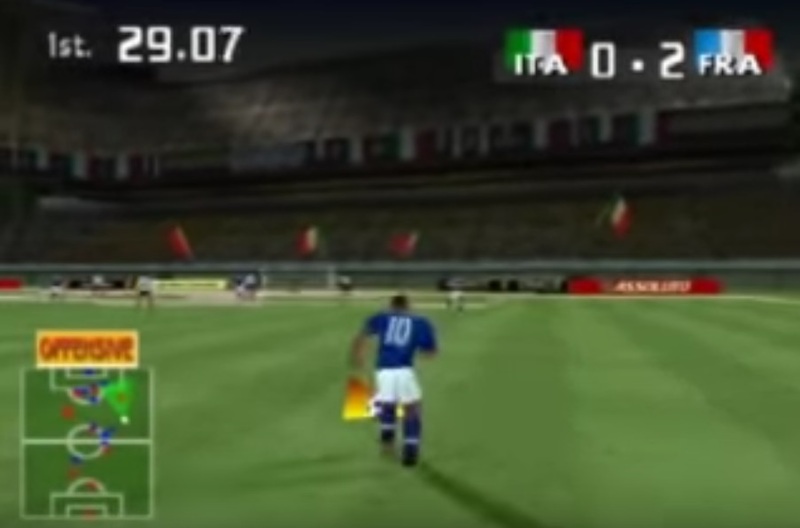 The idea of controlling a single player may have seemed boring and pointless to some at the time, but it was later adapted by both the Pro Evolution and FIFA series, showing that Libero really was a trailblazing legend of a game. 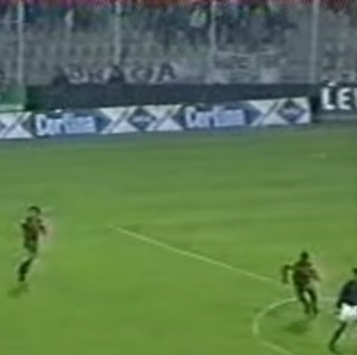 Last time in People On The Pitch, we looked at a fiery Italian affair in which Salernitana’s hopes of promotion in 1996 were dashed. We now turn to another end of season episode from a couple of decades earlier in England, but one with quite a different vibe. In January 1975, Brian Clough became the manager of English Second Division side Nottingham Forest. 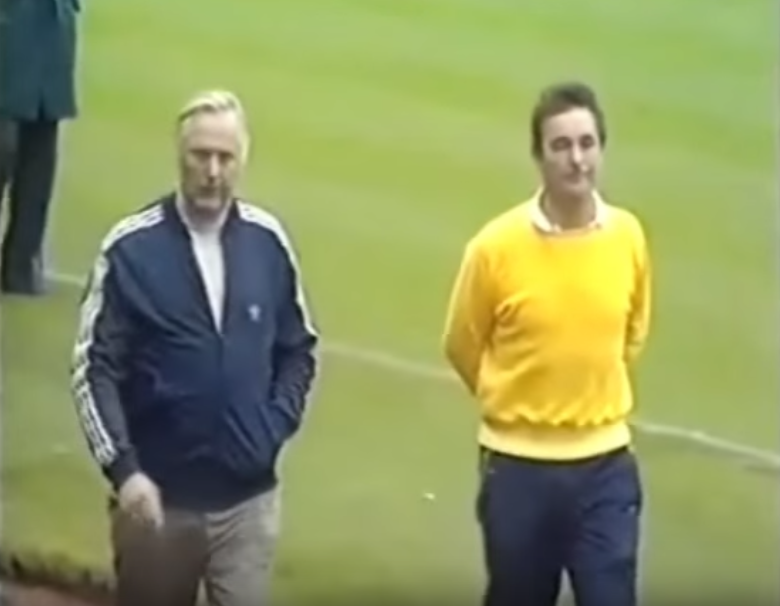 This came off the back of a disastrous 44 day spell as Leeds United manager the year before, but Clough had already won Second (68/69) and First Division (71/72) championships with Derby County, as well as victories in the prestigious Watney Cup (1970) and Texaco Cup (71/72). A 16th place finish was followed with an improved 8th in the manager’s first full campaign the next season, before the trajectory continued with 3rd in 76/77. The position meant automatic promotion for Forest, as this was before the days of play-offs when the top three finishers would go up. A goal and celebrations in Nottingham Forest's City Ground, vs Hereford United, as the home side head towards promotion, 76/77. 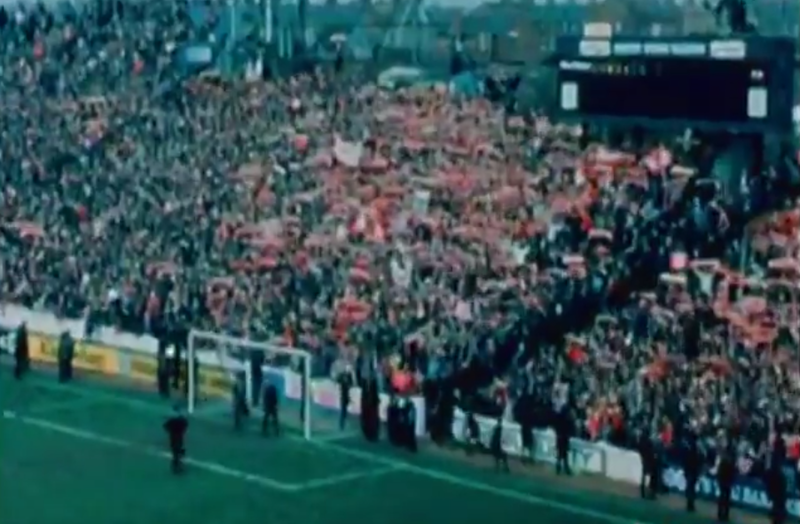 By the time 1978 rolled around, Clough’s team had only been defeated three times in Division One, with the latter of these – away to Leeds on November 19th – ultimately turning out to be their last league loss of the season. 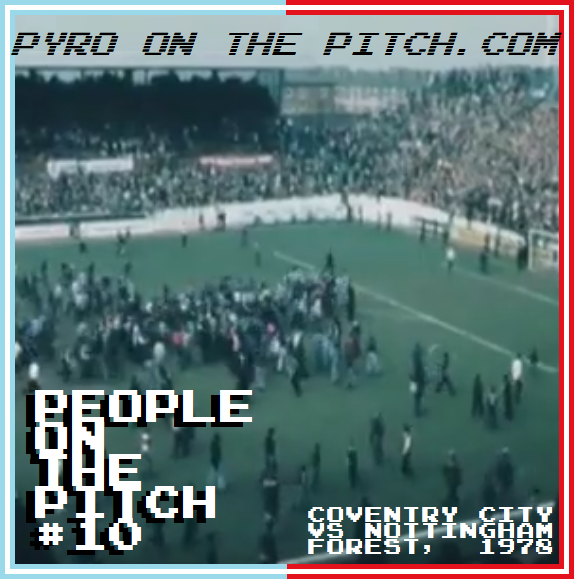 With two points awarded for a win at the time, a trip to Coventry City’s Highfield Road in April would see Forest take an amazing league title for the first time in their history with only a draw. 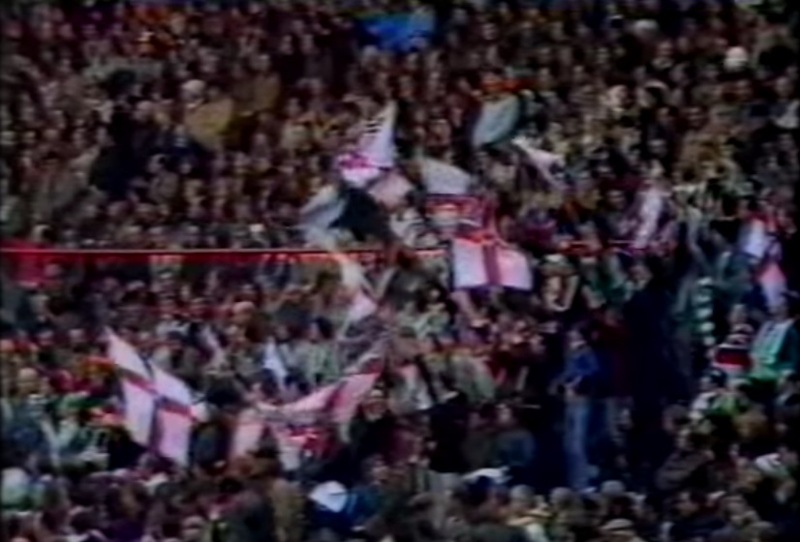 In terms of the fan scene, England was swiftly hurtling toward the hooligan hey day of the 1980s. 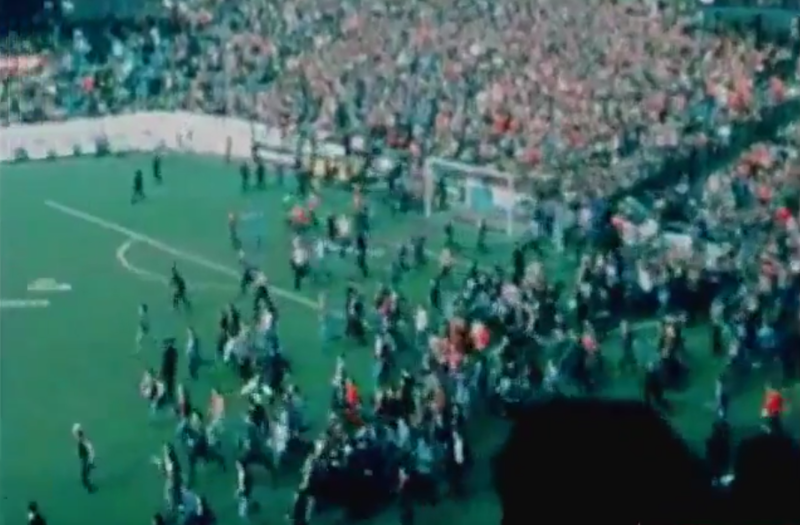 But of course the 70s had also it’s share of chaos, as fighting and pitch invasions became more and more common. 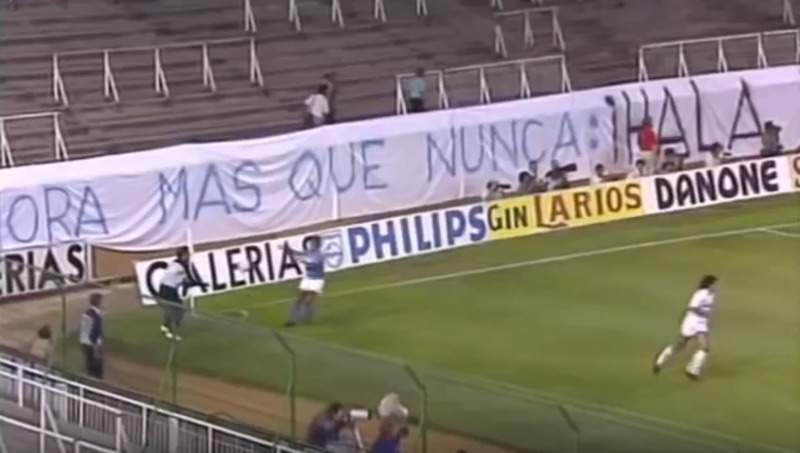 As the decade had progressed, joyful, celebratory invasions (such as this or this) were joined with deliberate attempts to stop matches when the result was not going your team’s way. 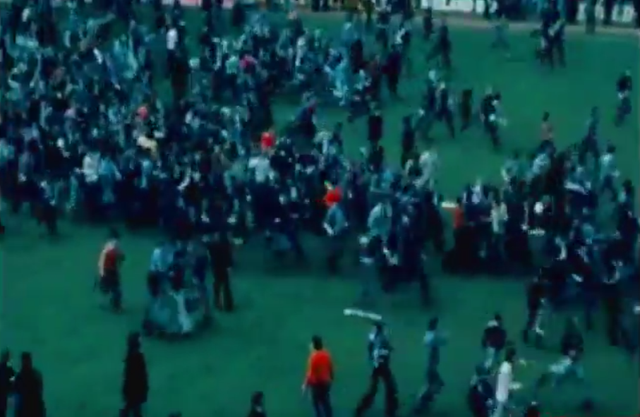 With organised hooligan firms already in places since the late 60s, at least in proto-form, violent encounters became more and more usual too, as demonstrated by a famous clip of a Chelsea fan outnumbered by flare and platform boot wearing Tottenham supporters in 1975. 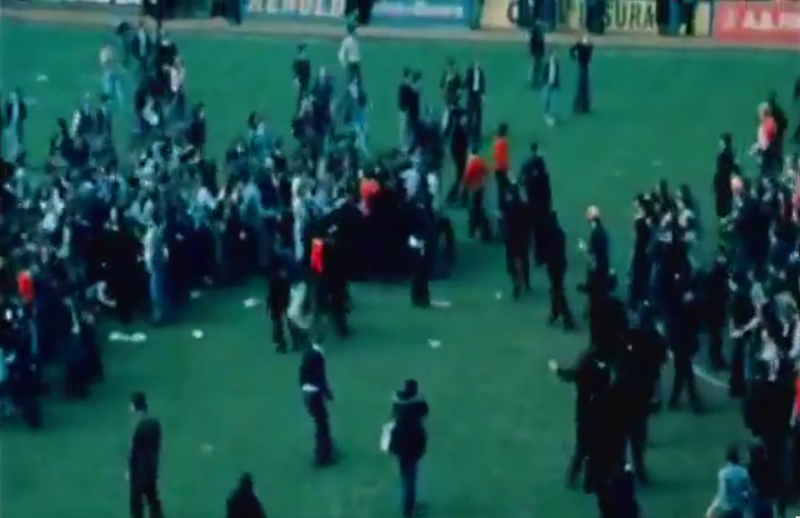 A section of the fighting on the pitch between Tottenham and Chelsea fans, 74/75 season. 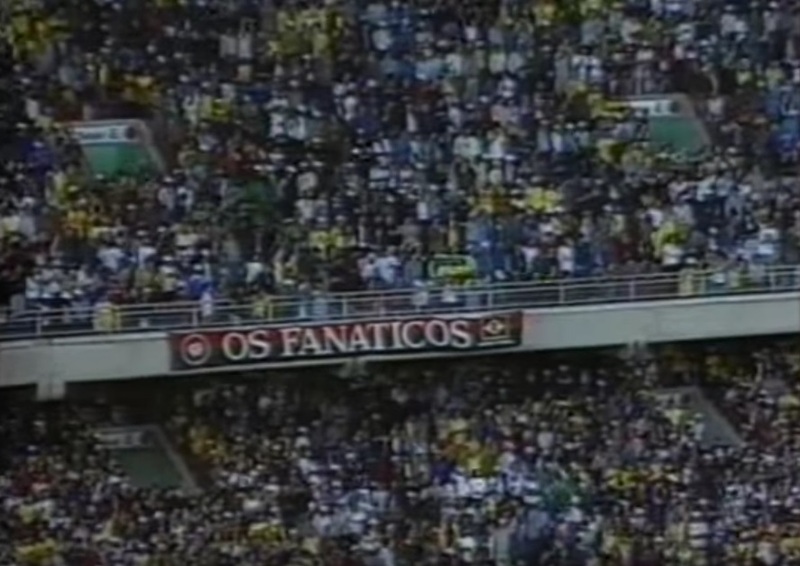 The activity of making your way on to the pitch went “viral”, with many young, mischievous fans seeing it as a marked target. By the 80s, this would manifest in menacing fencing in many grounds around the country, with disastrous results later. 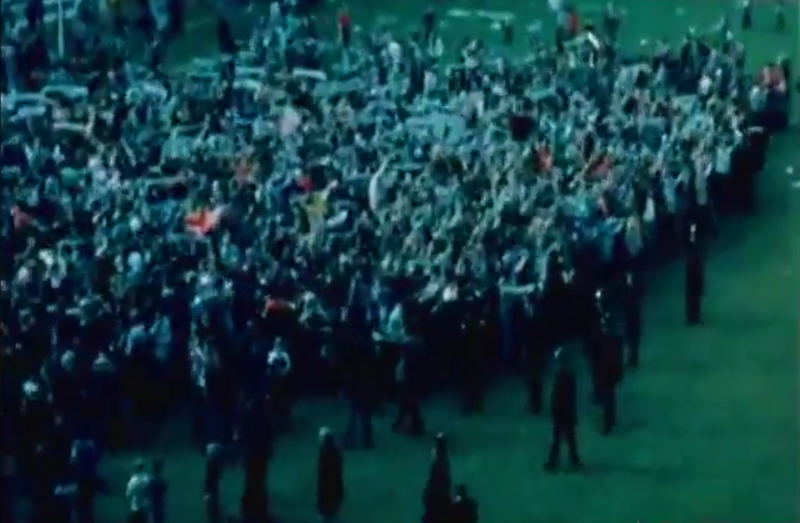 But until then, it remained easy for larger and larger numbers to leave the terraces and hit the grass, as that April day in Coventry would show. But we still haven’t gotten to our people on the pitch. And so concludes our story. 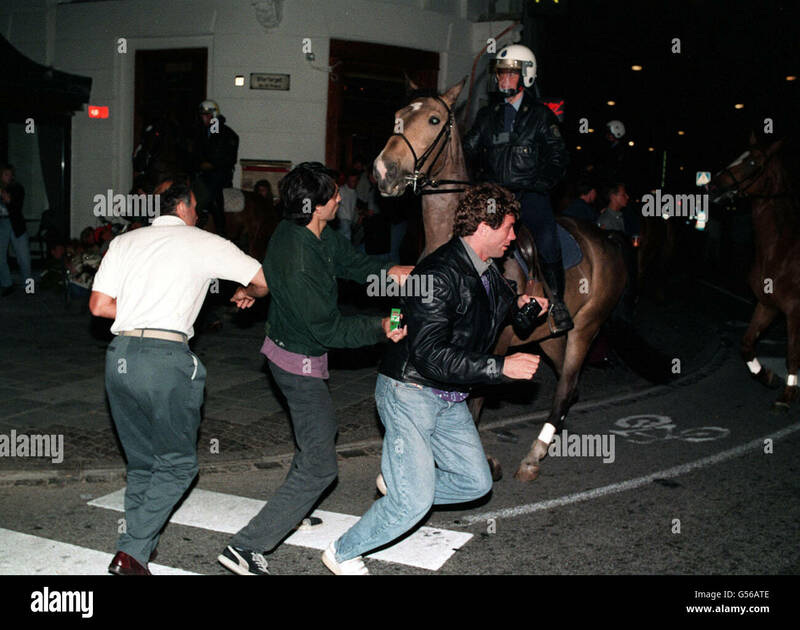 It may not have been a particular aggressive incident – more like young people showboating and taunting each other than hardened hooligans fighting – but the sheer astonishing scale of the invasions clearly displayed that the amount of police deployed would not be equipped to deal with any potentially explosive situations in the might occur in the future, as things got even more out of control. 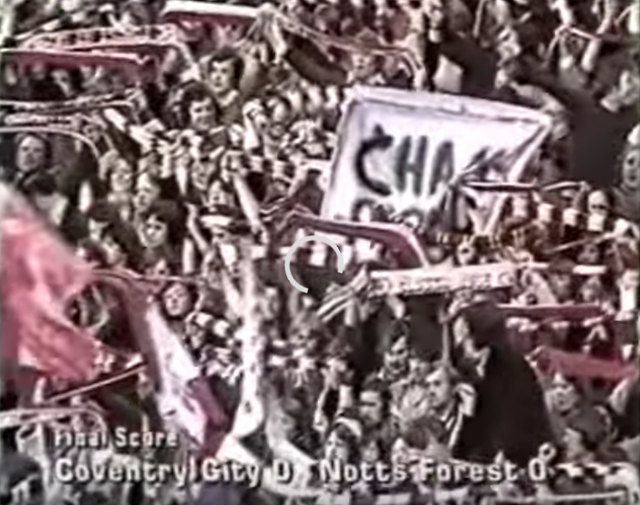 As for the two teams involved, Clough’s Forest would go on to make even more history with back-to-back European Cup wins in 1979 and 80. 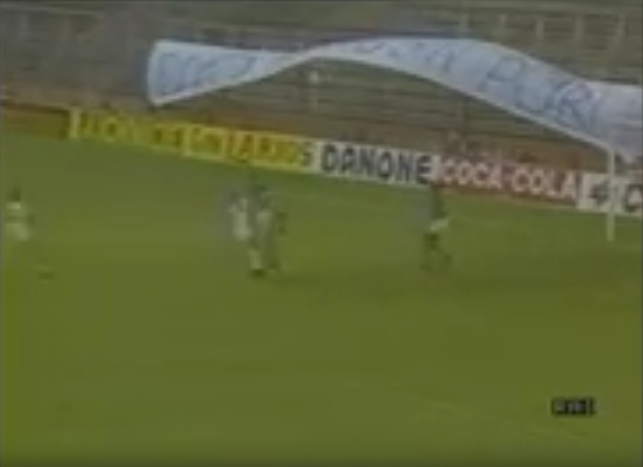 Meanwhile, Cov’ would finish in 7th that 77/78 season, one place off the UEFA Cup spots. 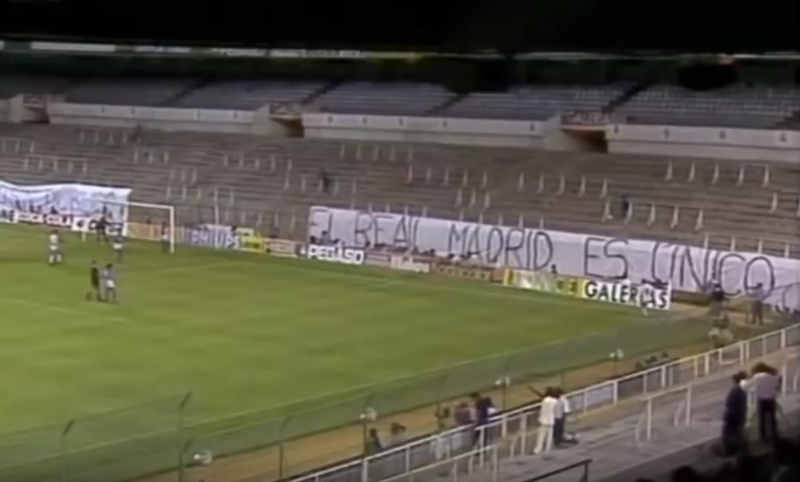 They would not go on to make history with back-to-back European Cups. 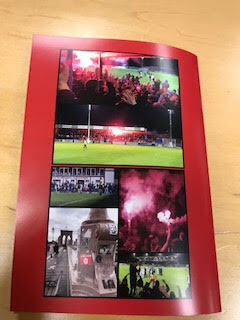 The third in our now regular guest spot in the Shelbourne FC fanzine Red Inc. has been published. Using the Football Special Report series as our vehicle, we delve into the “Early Modern” world of the football kit and the proto-days of shirt numbers, branding (of both manufacturer and sponsor), non-traditional football boots, printed player names, and national teams sponsors. 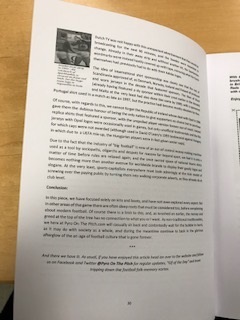 Below is a short excerpt and some pictures of the piece, including the excellent front and back covers, with this issue, RI65, celebrating 20 years of the fanzine. 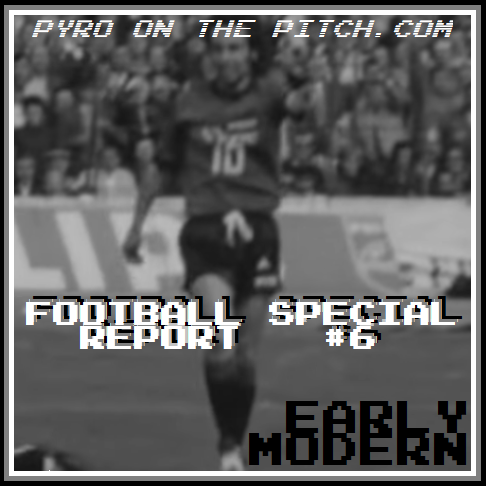 Both our earlier contributions are now on the site, so click here for our Shels special Pryo On The Pitch #10 or Retro Shirt Reviews #7, and keep a look out for the article in question here to pop up on online in the not so distant future. Thanks as always to the publishers, supporter group Reds Independent, for having us. …Organised football does not have quite as long a history, although there is something intriguingly esoteric about nature of the sport (man’s attempt to control the inherent “chaos” of a sphere, or “planet”, within the lines of order, or “civilisation”, that he has created) that seemingly gives it a huge appeal to all classes of human. But as sport, and football in particular, is always a mirror for the greater world, the post-modern macrocosm of society is reflected in the post-modern microcosm of the game. Considering the grim realities that lay behind the wealth of “western culture” these days, and therefore likewise behind the massive industry of professional soccer, most of us are not fans of this fact and lament the grotesque, corrupted demon-spirit that metaphorically controls the sport at the highest levels. True local football grounds like Tolka Park (for the moment) at least still give real supporters the chance to continue to experience a purer form, unlike conditions at corporatised top flight stadiums around Europe and the Sky Sports-watching culture.